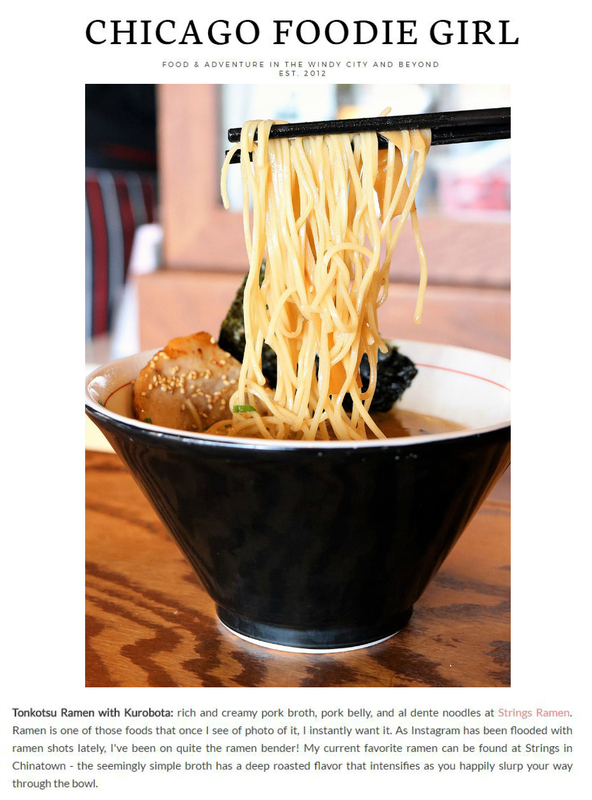 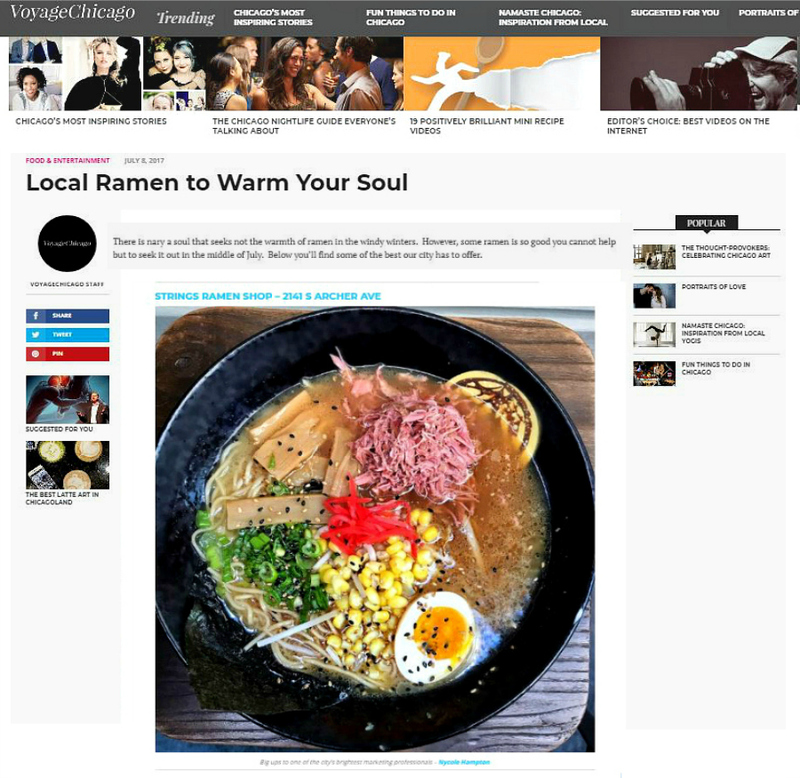 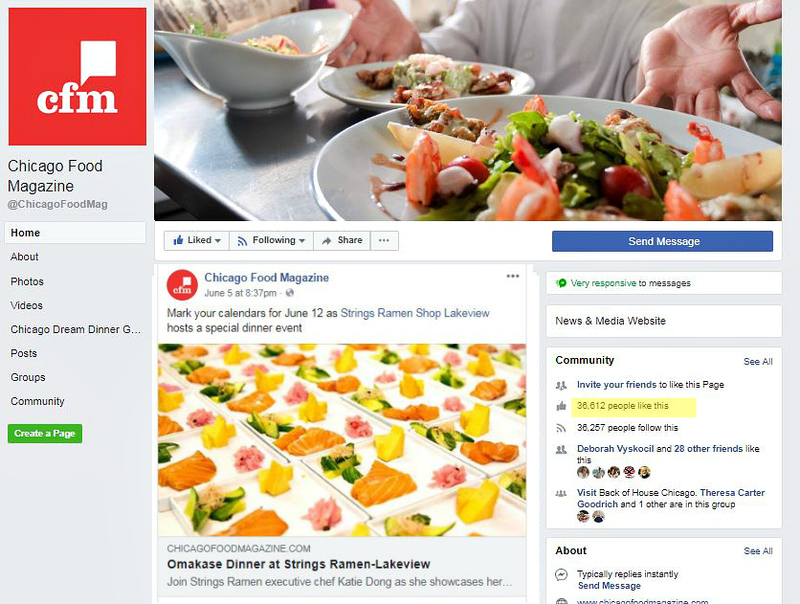 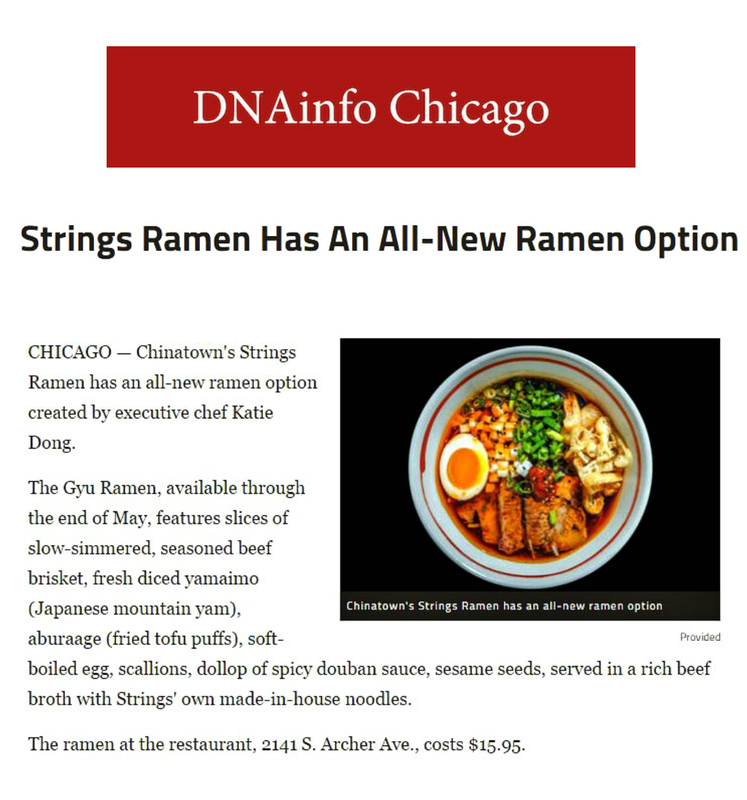 Strings Ramen, the wildly-popular granddaddy of Chicago’s ramen scene, consistently ranked among best in Chicago, has now opened a second location — at 919 West Belmont Avenue in Chicago’s Lakeview neighborhood. 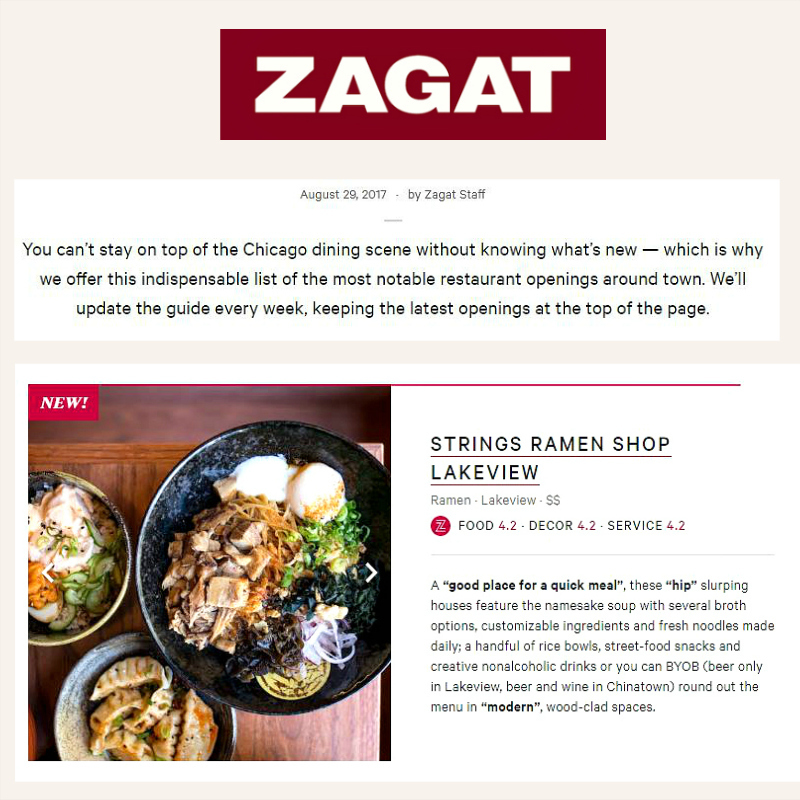 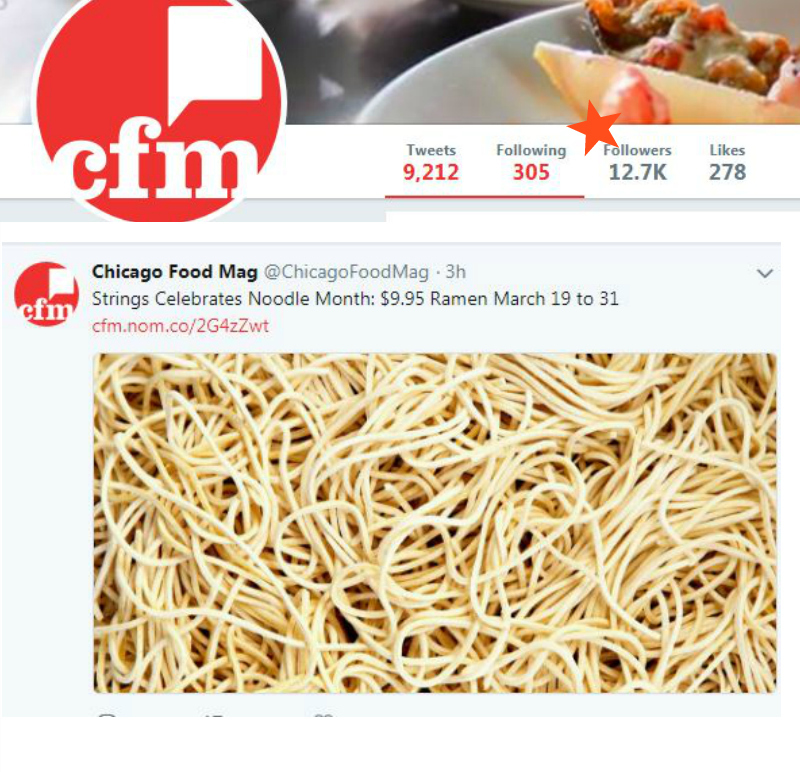 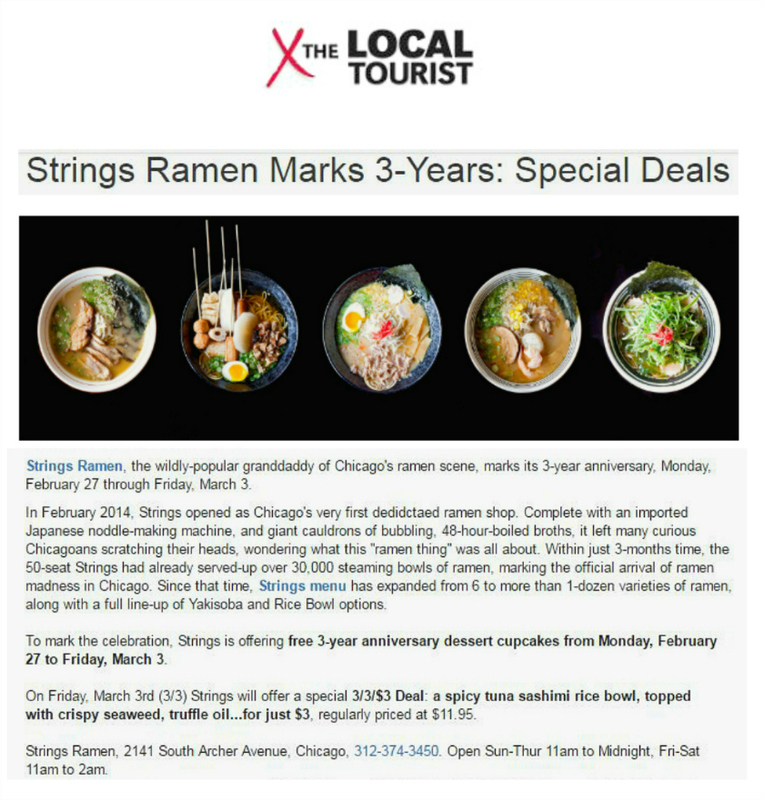 The 40-seat space has a similar look, is a mini-version of Strings’ 65-seat Chinatown location, which opened Feb 2014 as Chicago’s very first dedicated ramen shop. 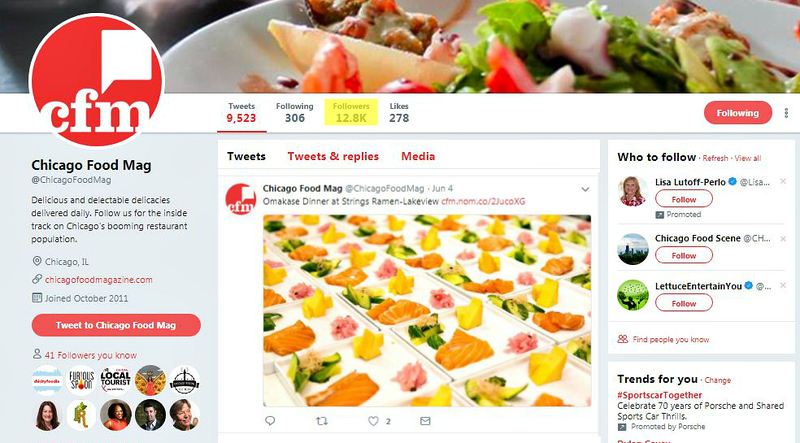 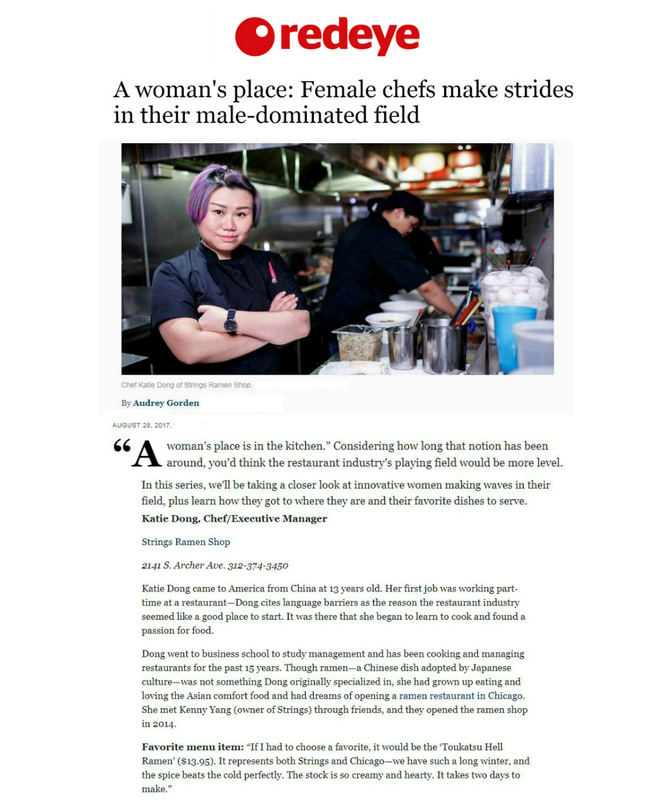 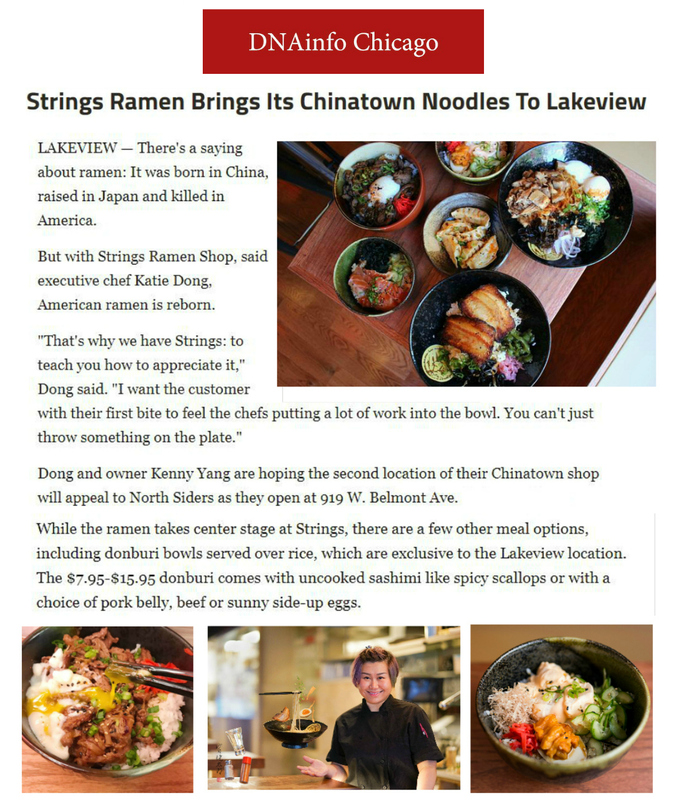 Chef Katie Dong now serves as executive chef of both the Lakeview and Chinatown locations. 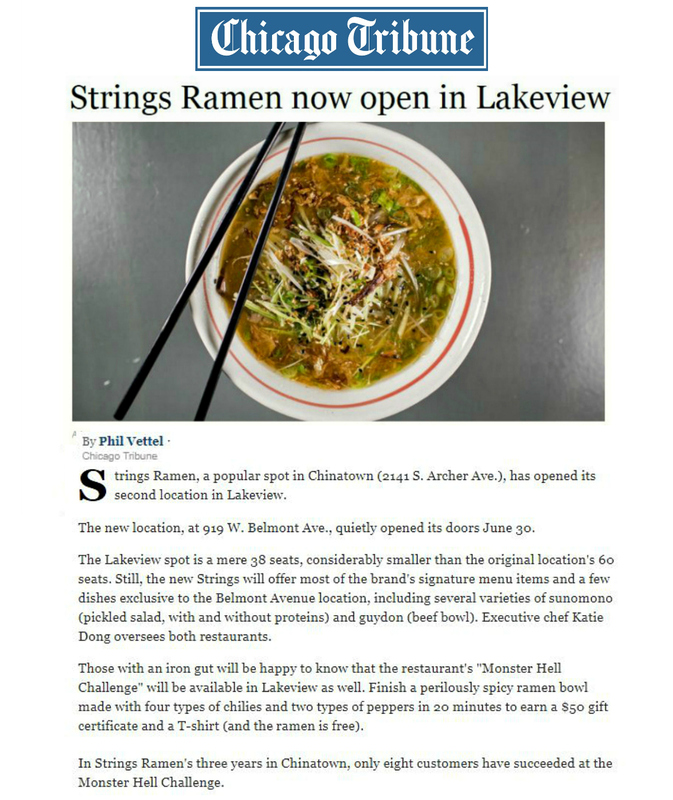 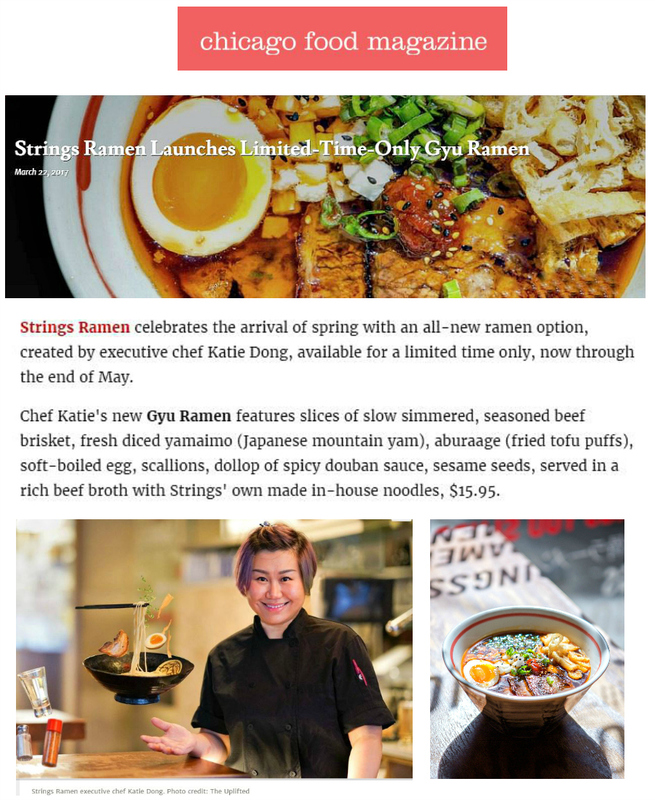 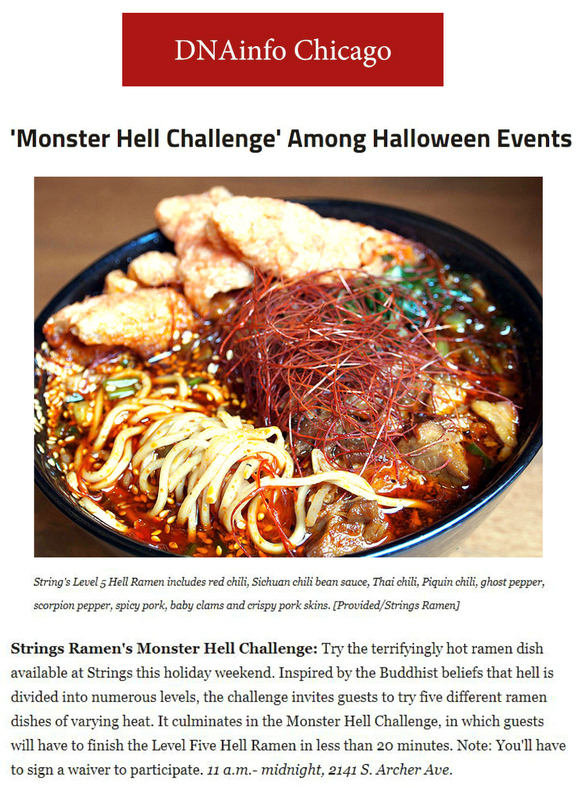 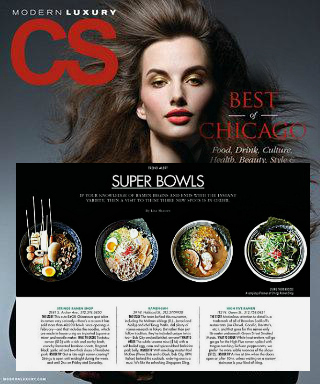 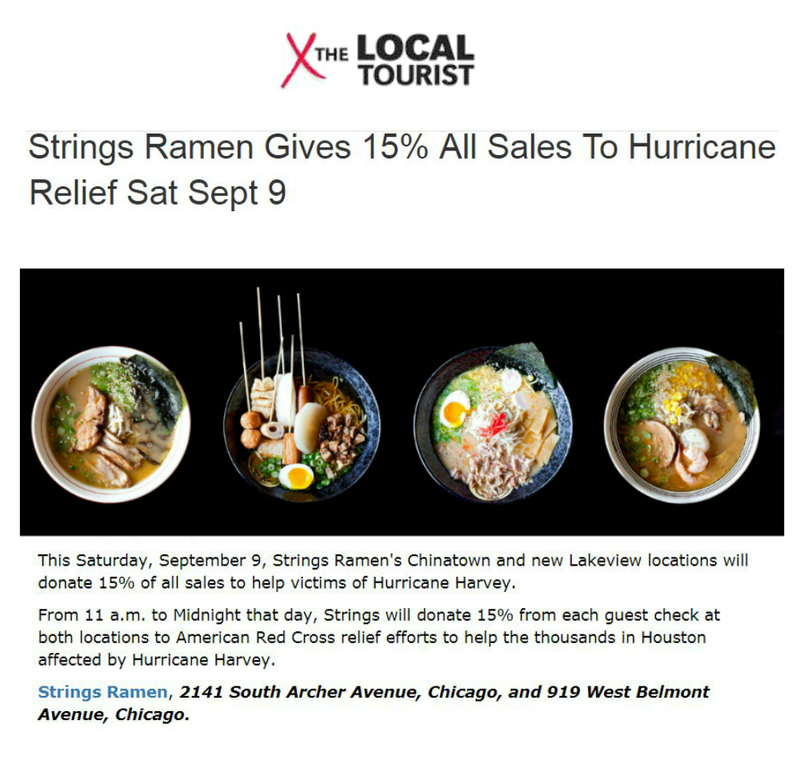 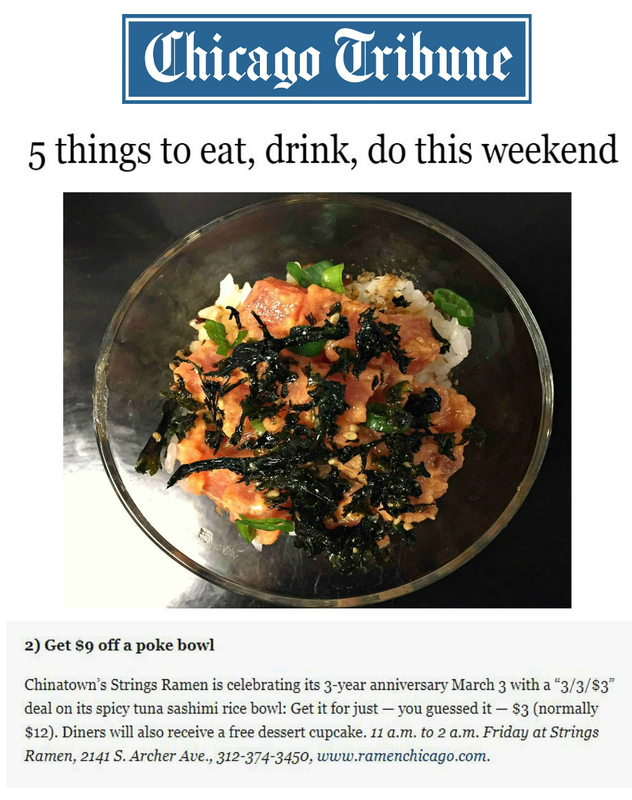 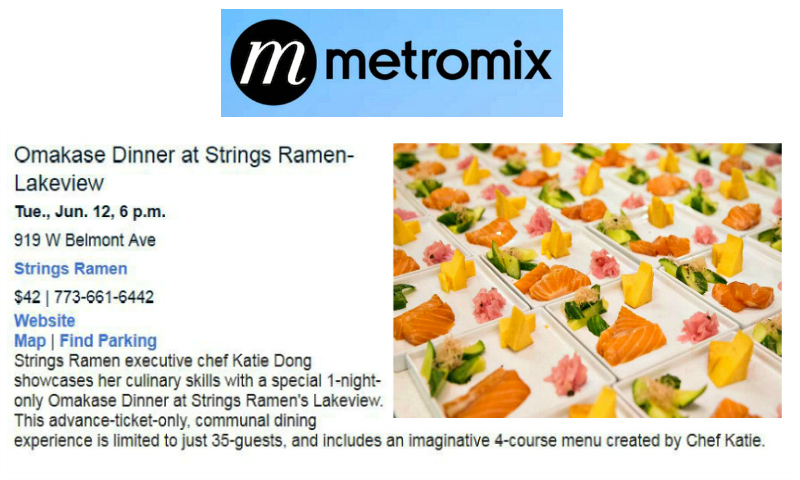 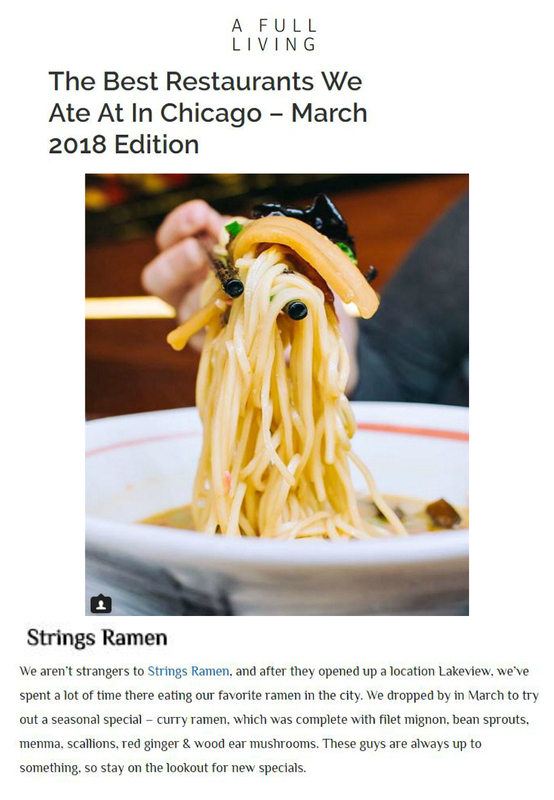 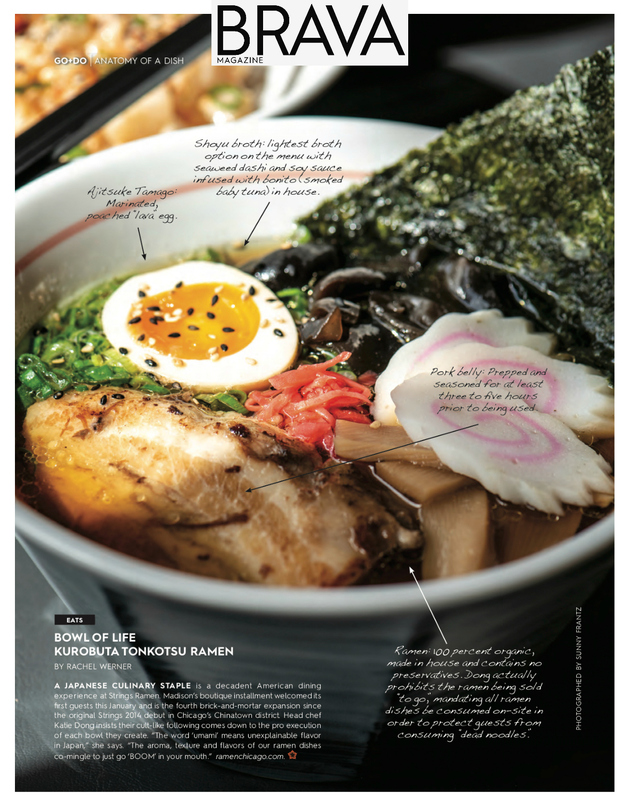 In addition to Strings popular ramen selections, Chef Katie’s created a number of items that are exclusive, only available at Strings’ new Lakeview location, including a number of meat and sashimi rice bowls. 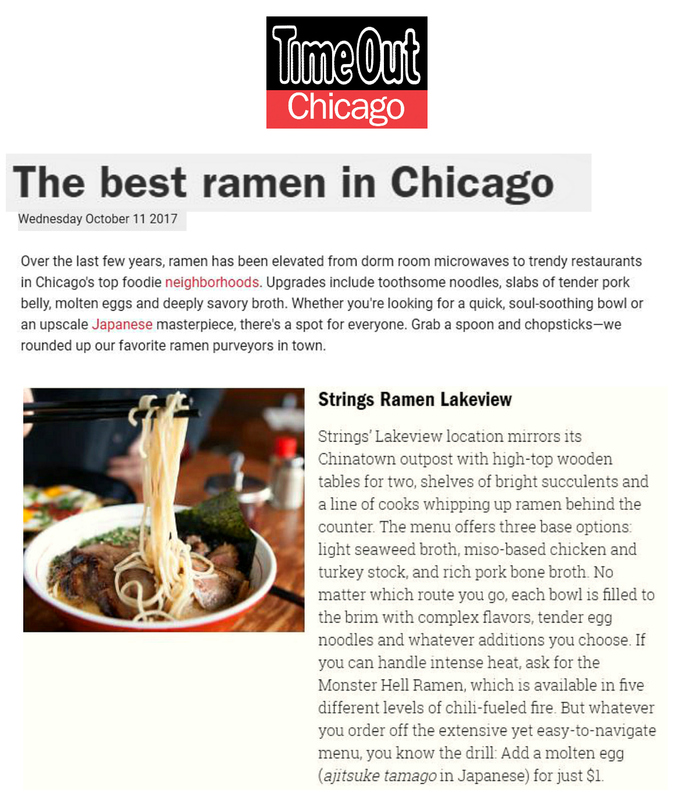 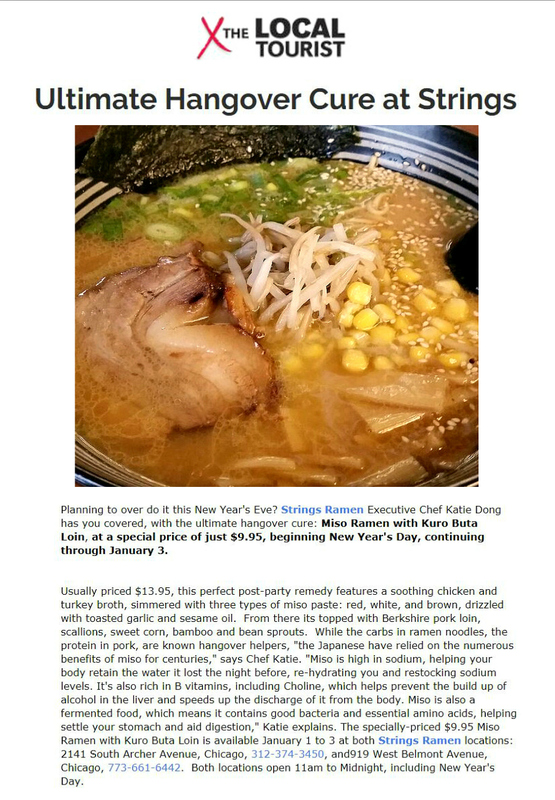 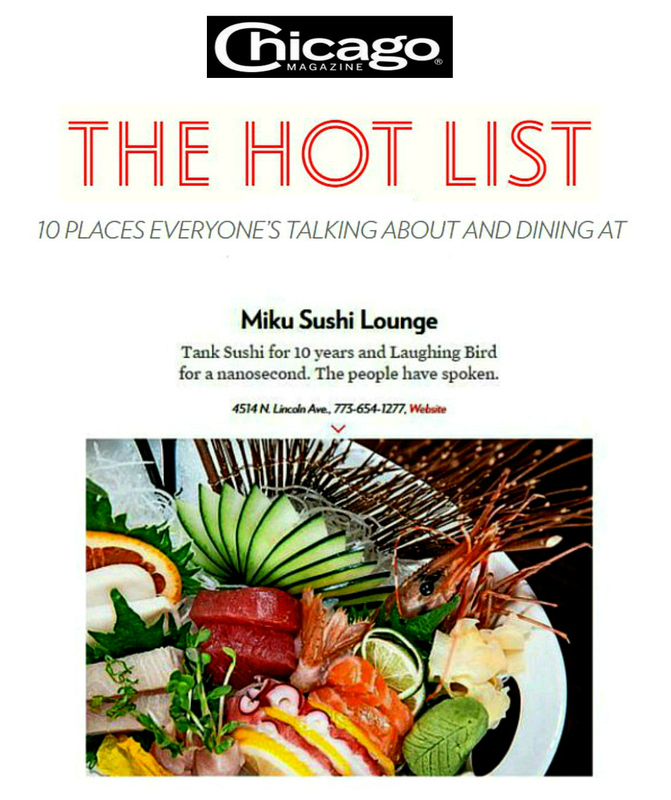 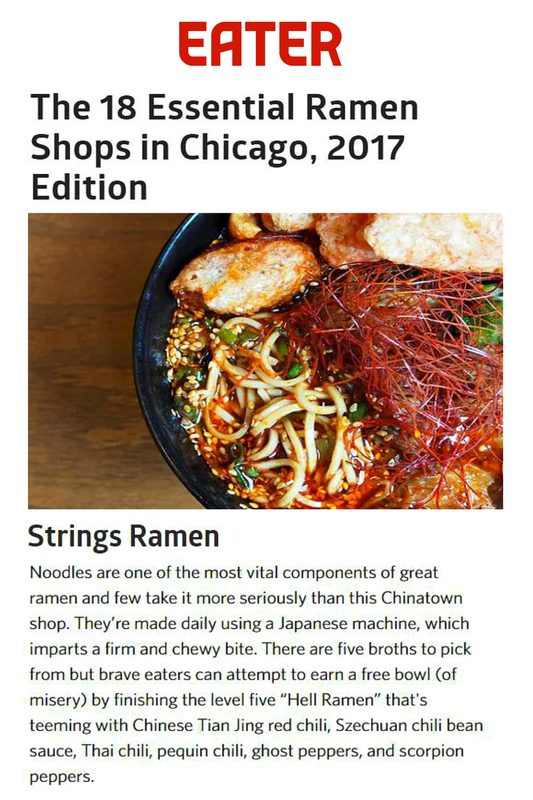 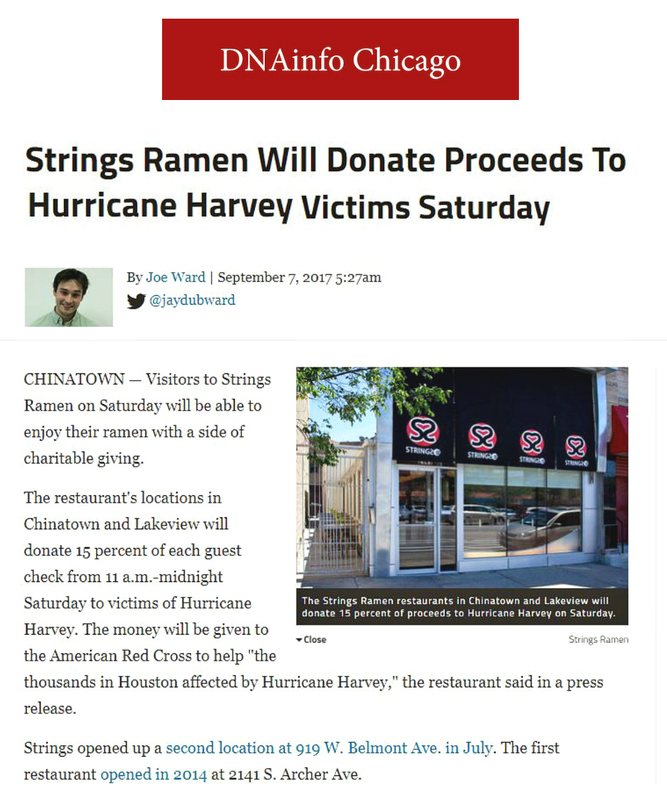 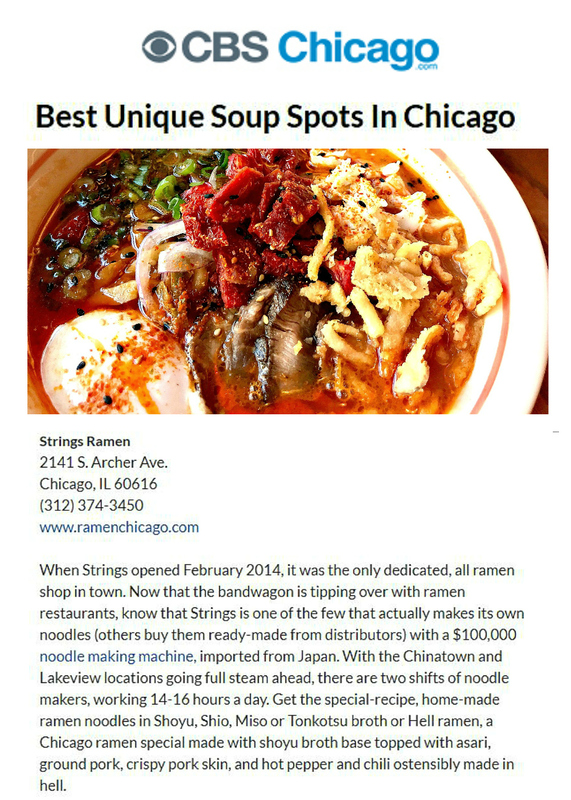 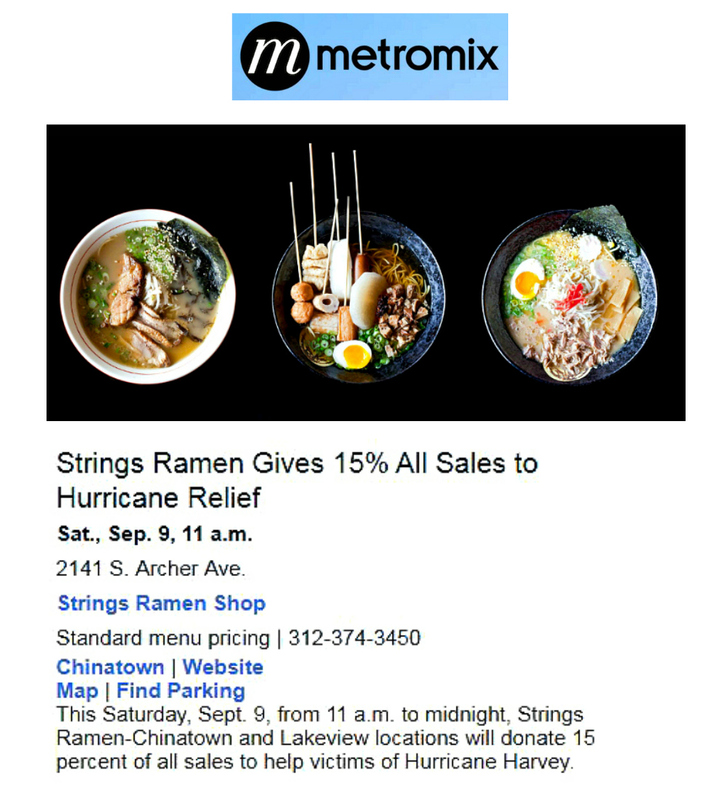 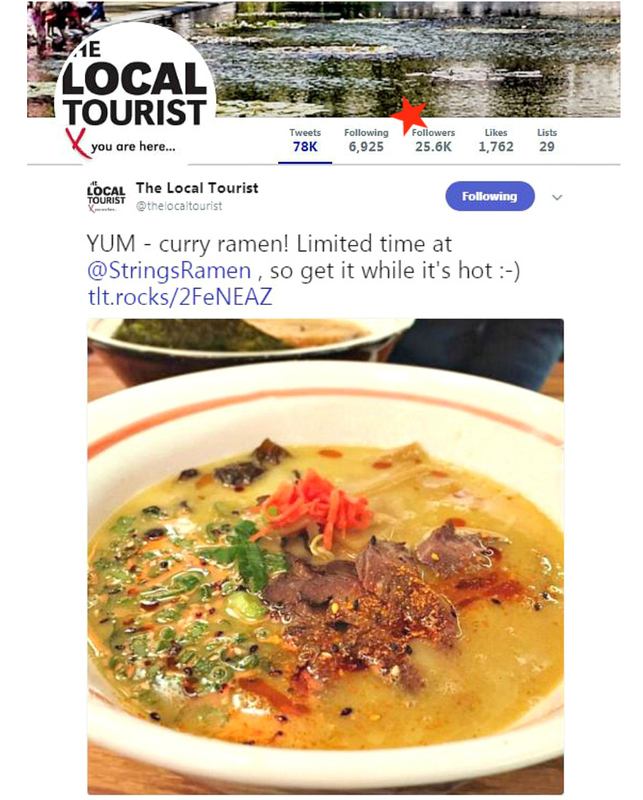 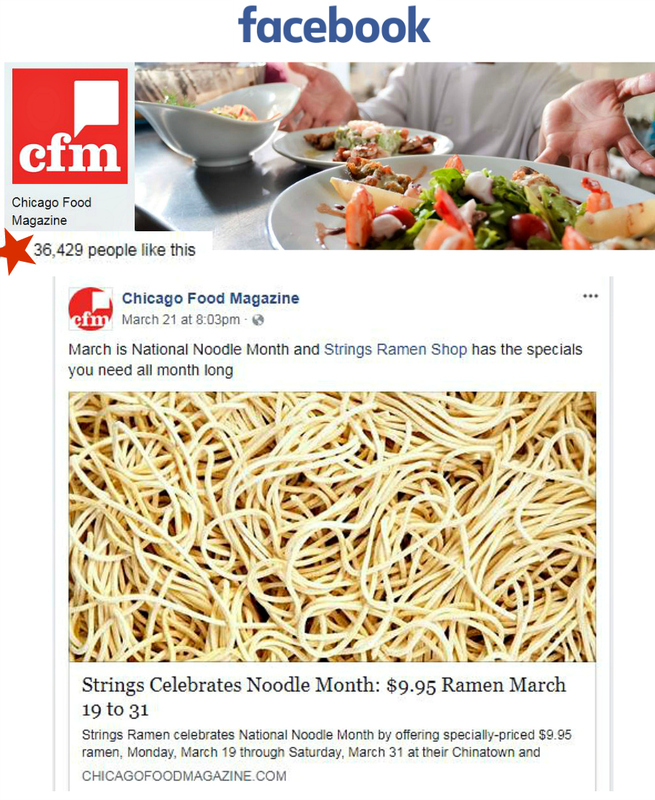 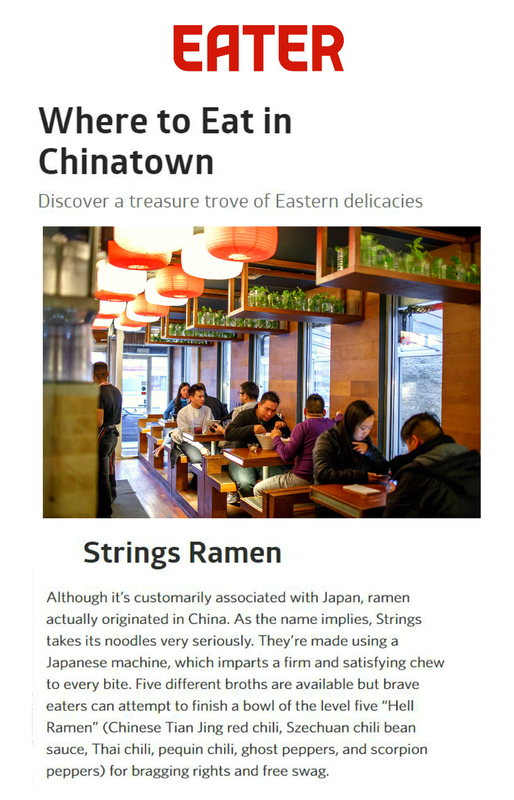 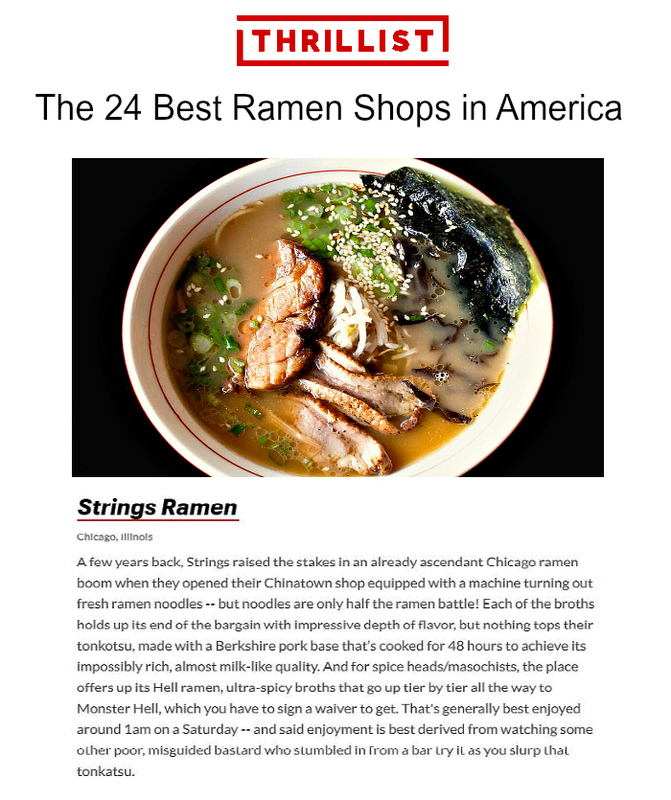 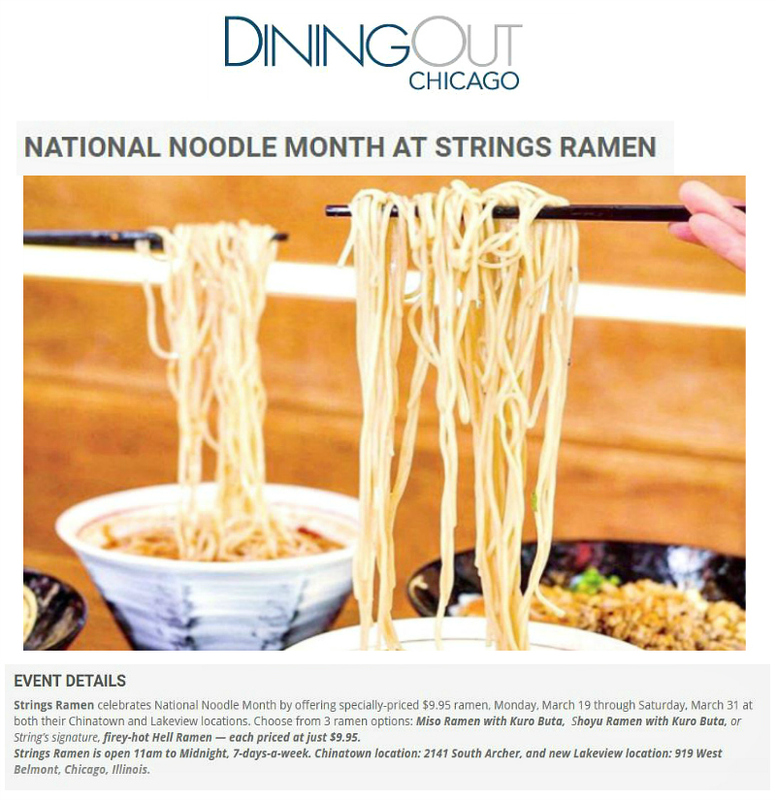 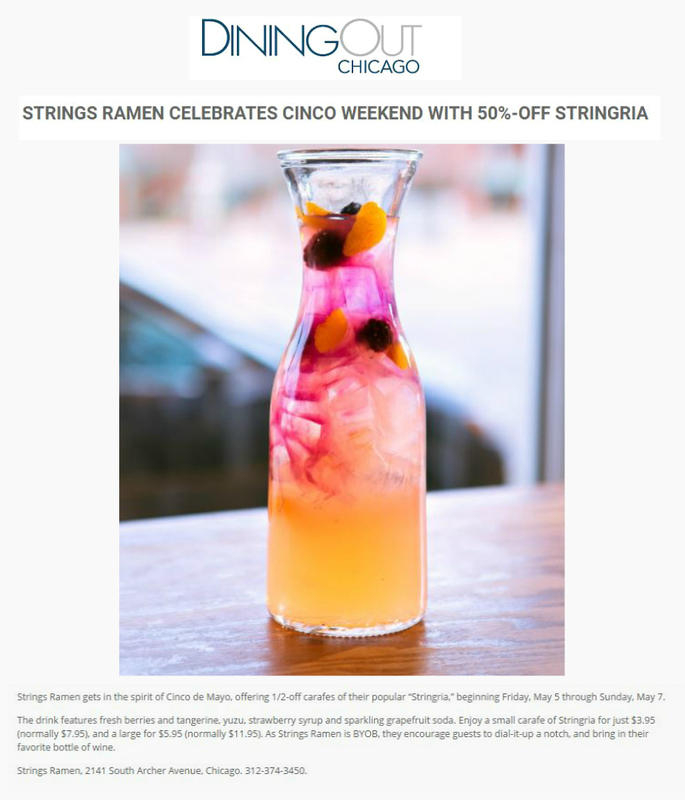 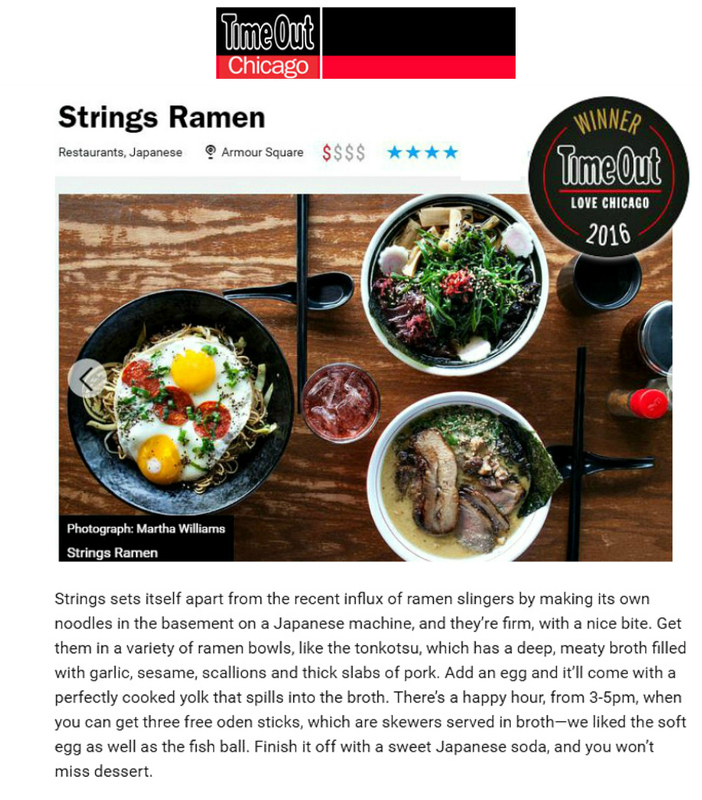 Strings Ramen-Lakeview, 919 West Belmont, Chicago, IL 60657. 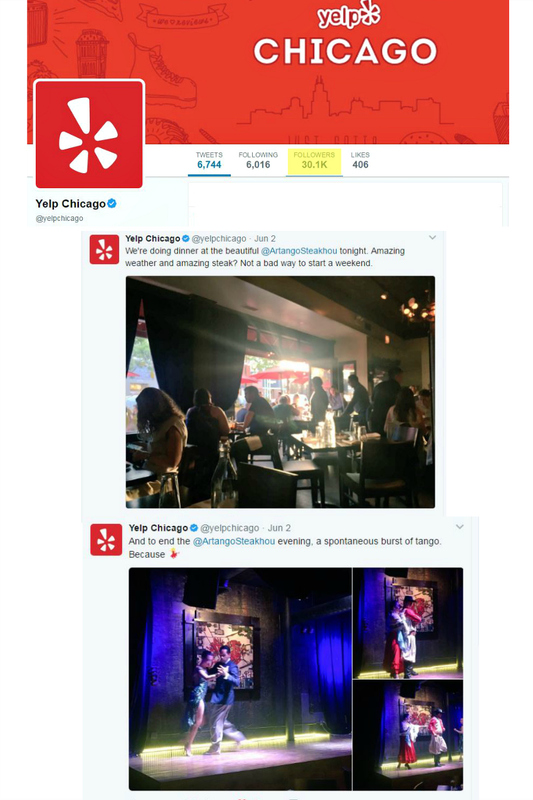 773-661-6442. 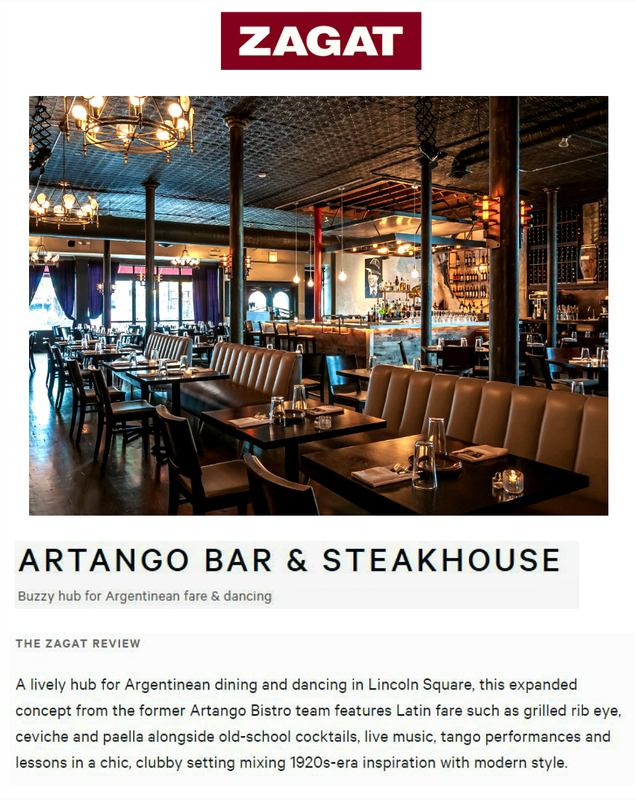 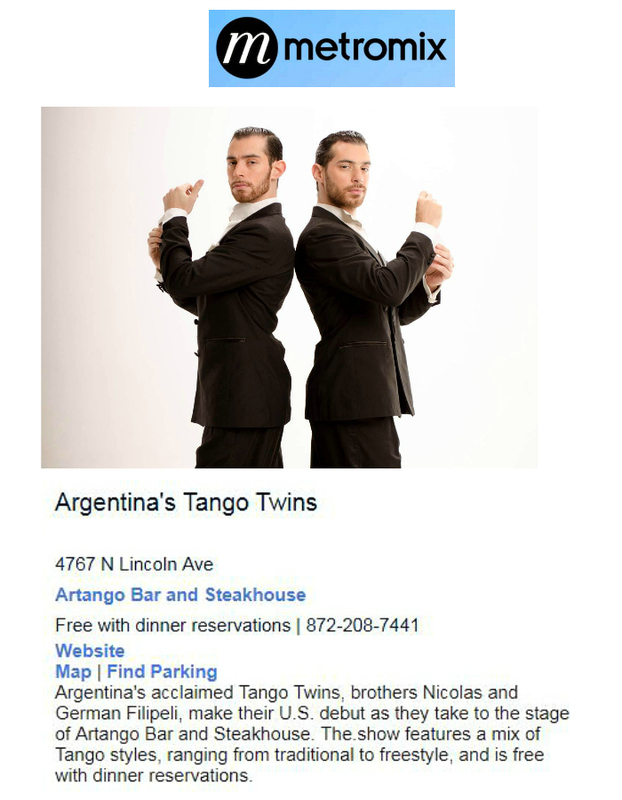 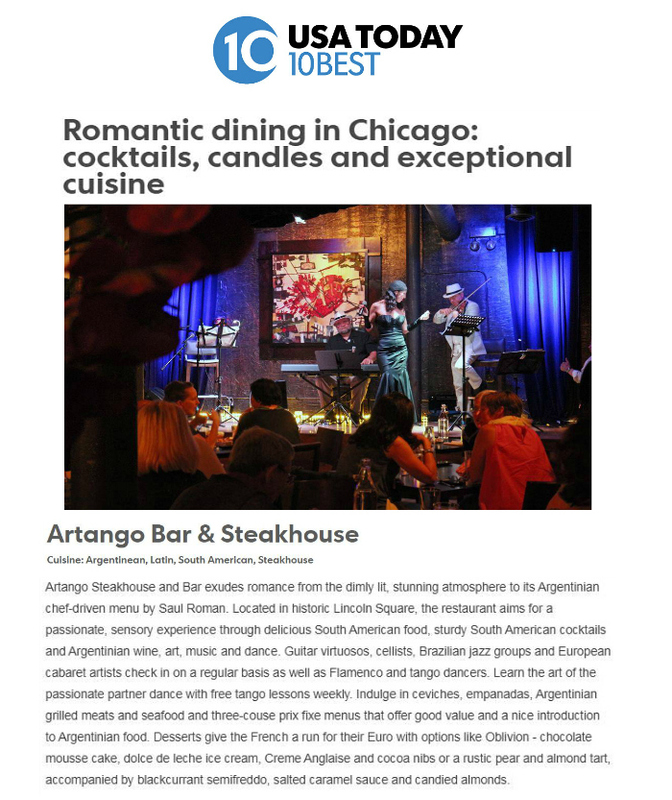 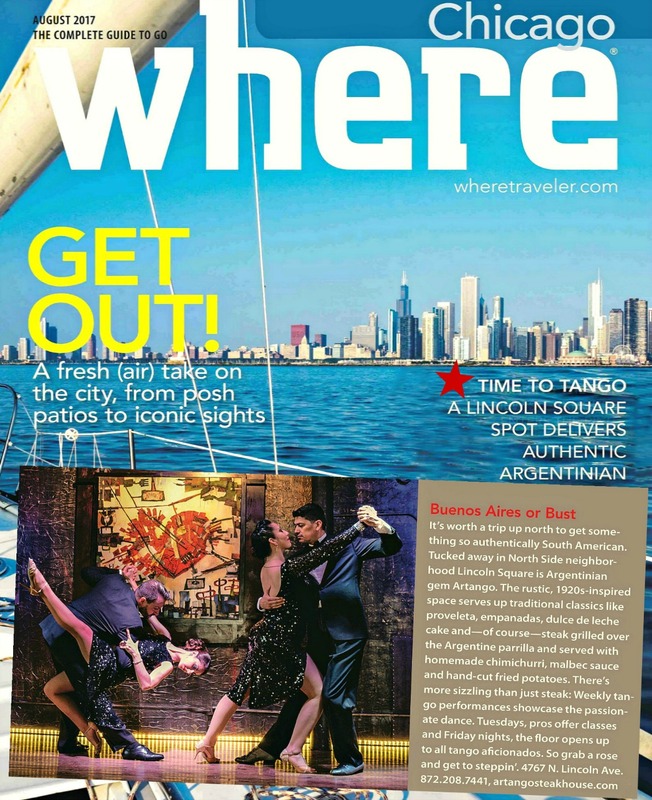 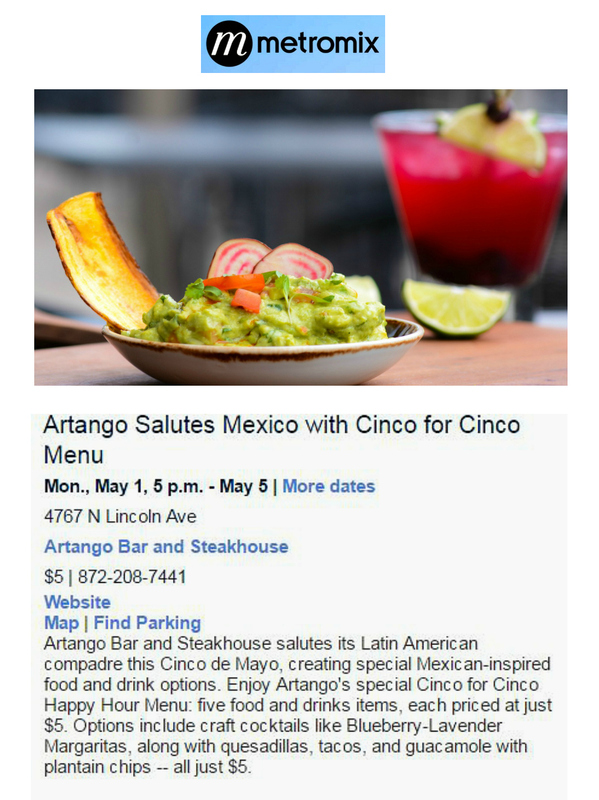 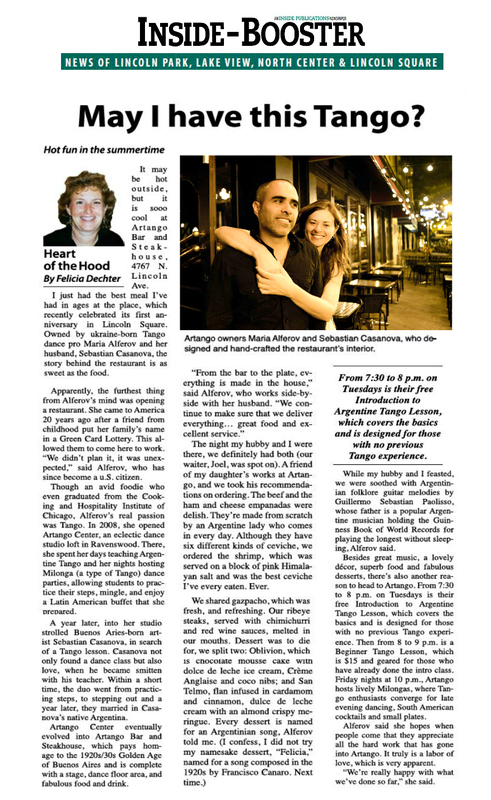 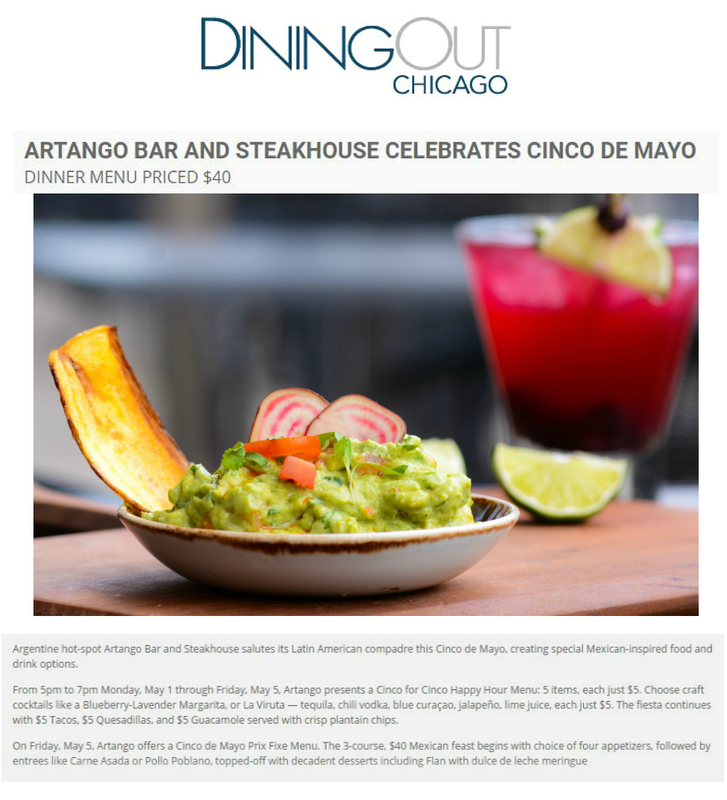 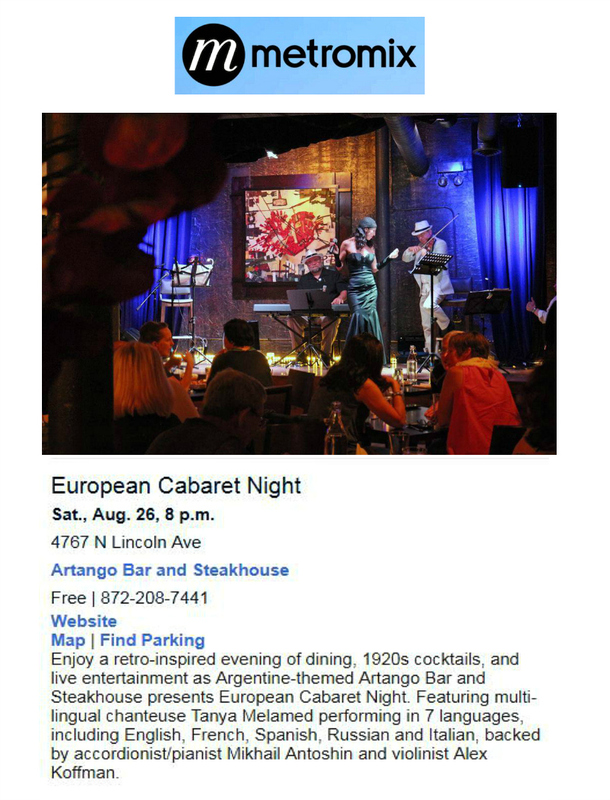 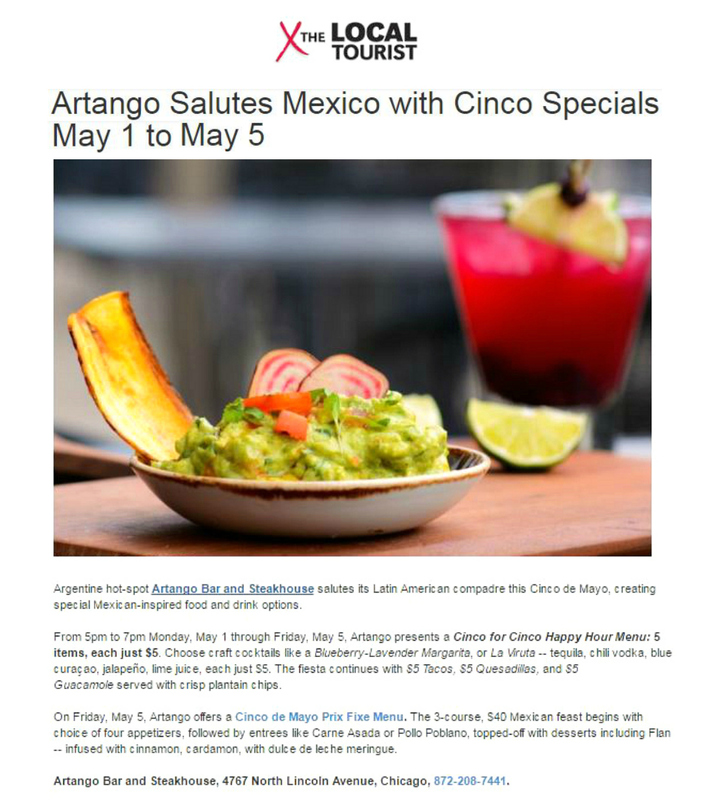 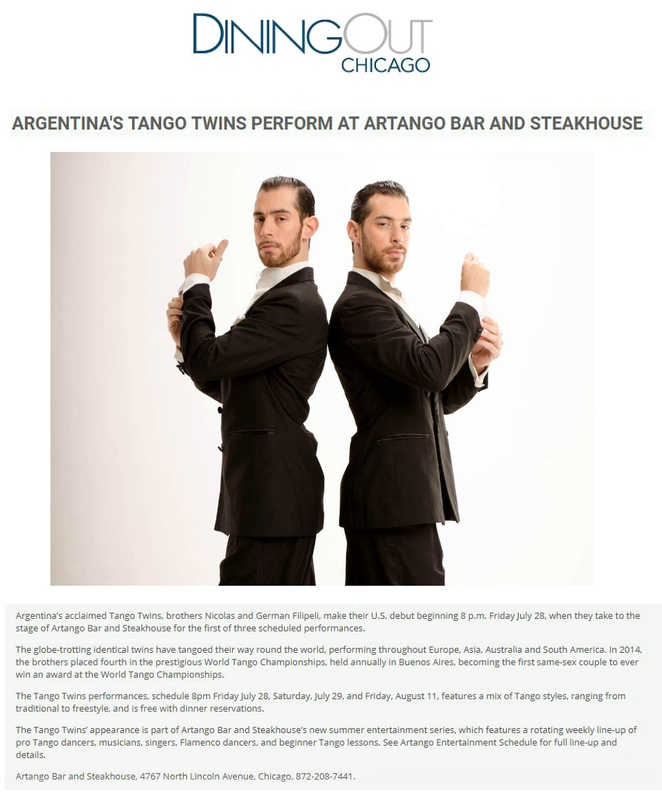 Artango Bar and Steakhouse has become a lively hub for Argentinean dining, dancing, and live music since expanding to Lincoln Square in April 2016. 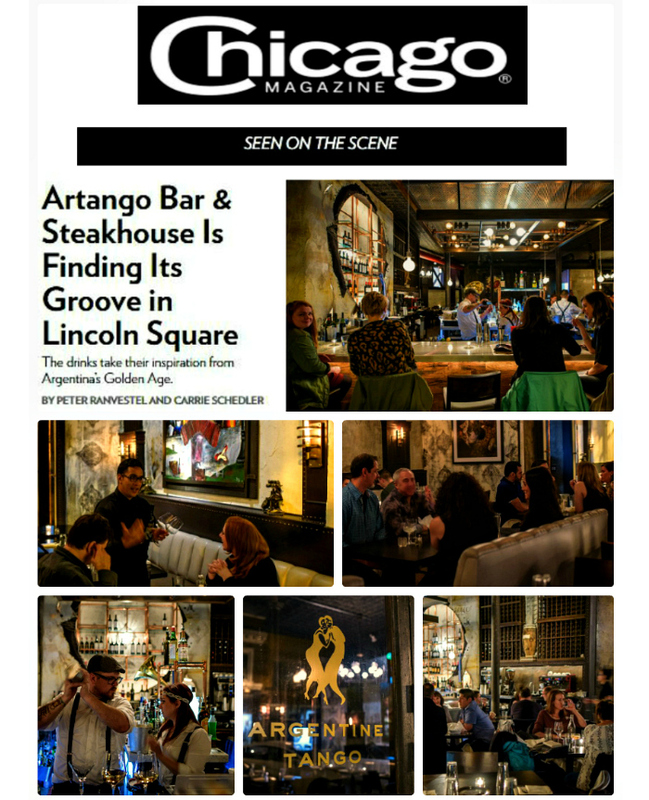 Recently featured on Check Please, Artango draws inspiration from the 1920s Golden Age of Buenos Aries, with prohibition-era cocktails, authentic parrilla-grilled steaks, meats and seafood, along with other Argentine and Latin American favorites. 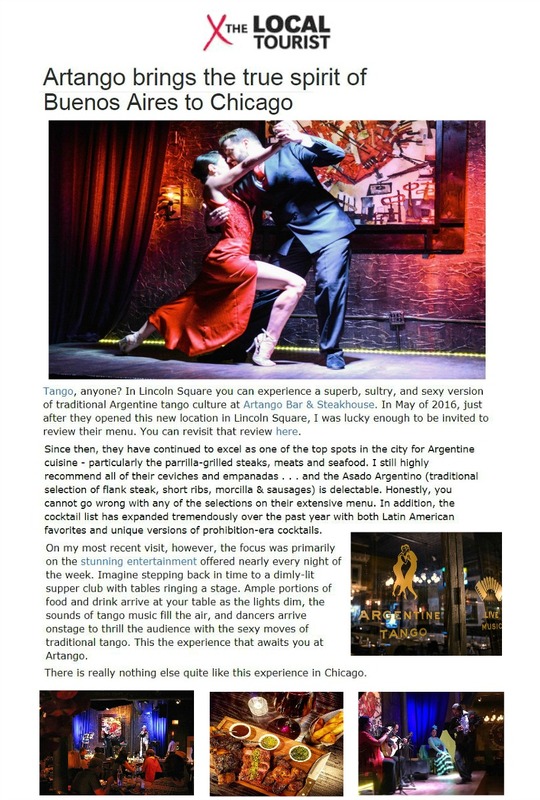 Artango now also features a rotating weekly showcase of live entertainment, including pro Tango dancers, musicians, singers, Flamenco dancers, and beginner Tango lessons. 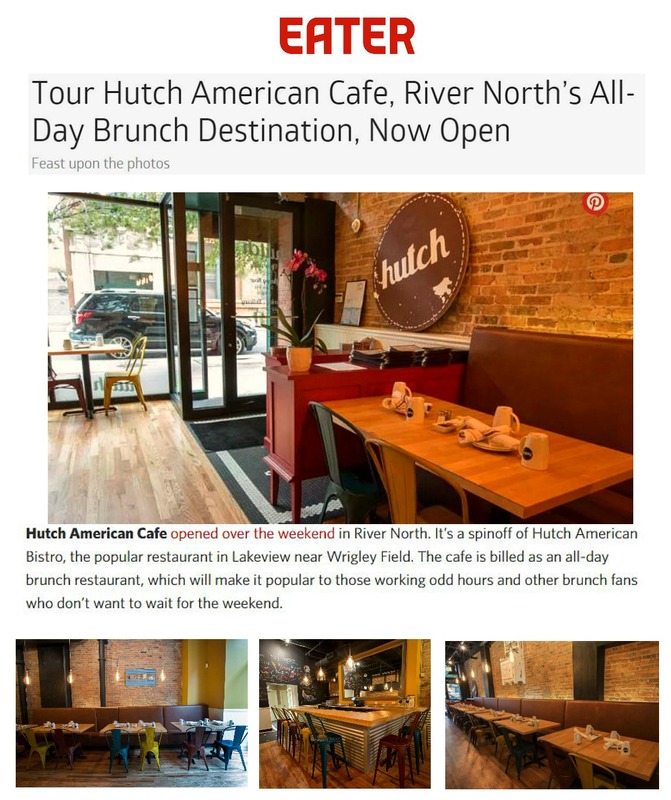 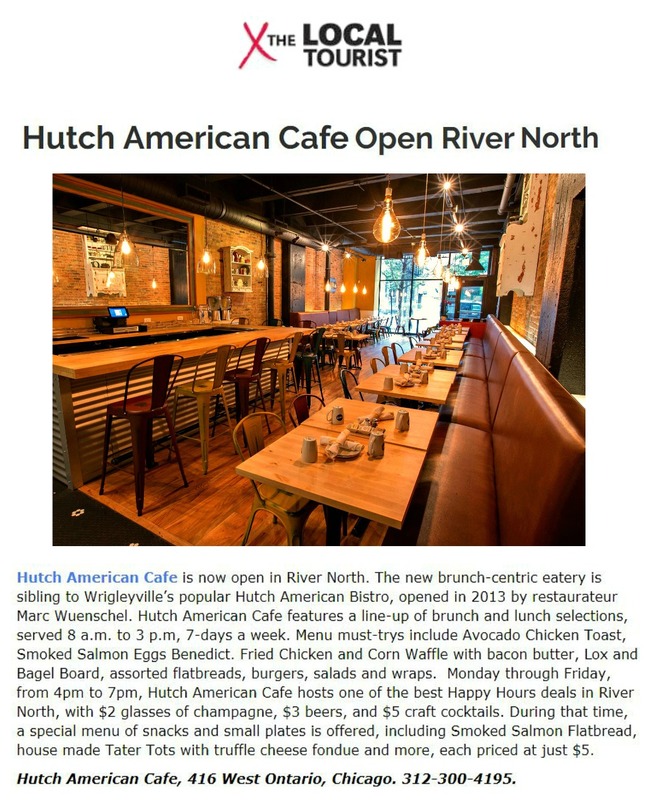 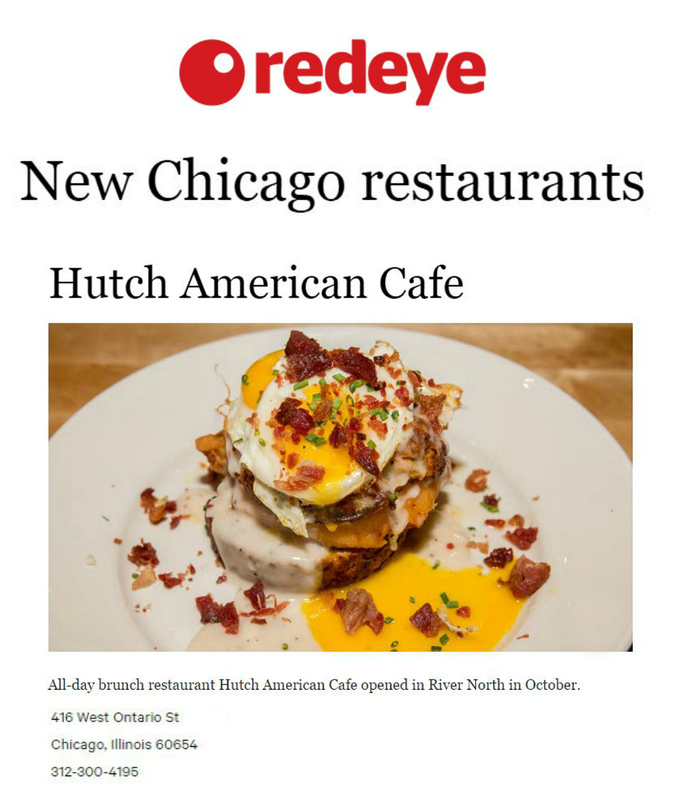 Hutch American Cafe is now open in River North. 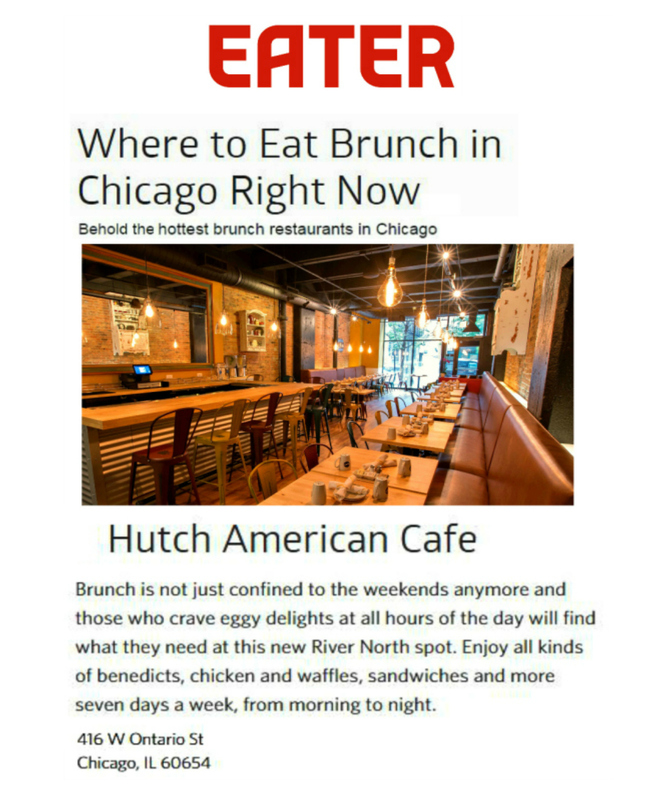 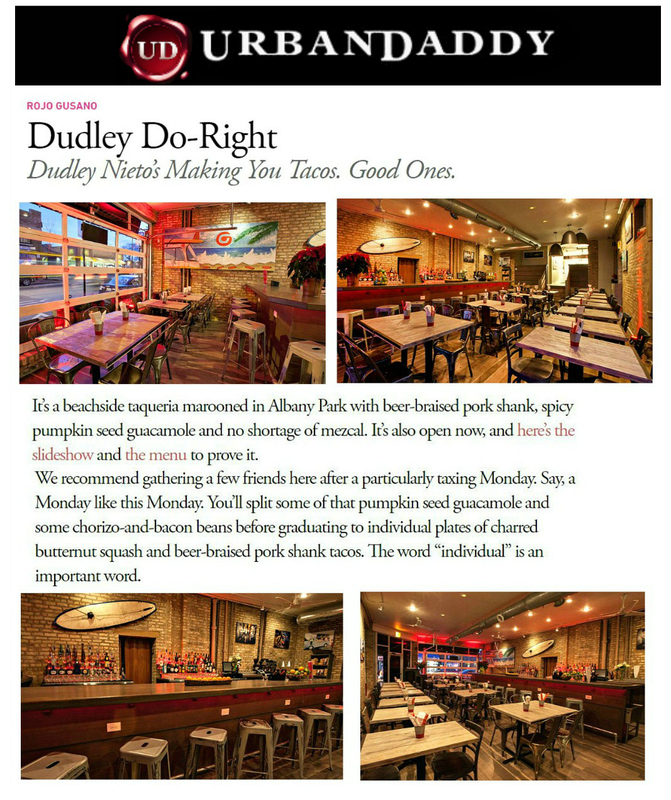 The new brunch-centric eatery is sibling to Wrigleyville’s popular Hutch American Bistro, opened in 2013 by restaurateur Marc Wuenschel. 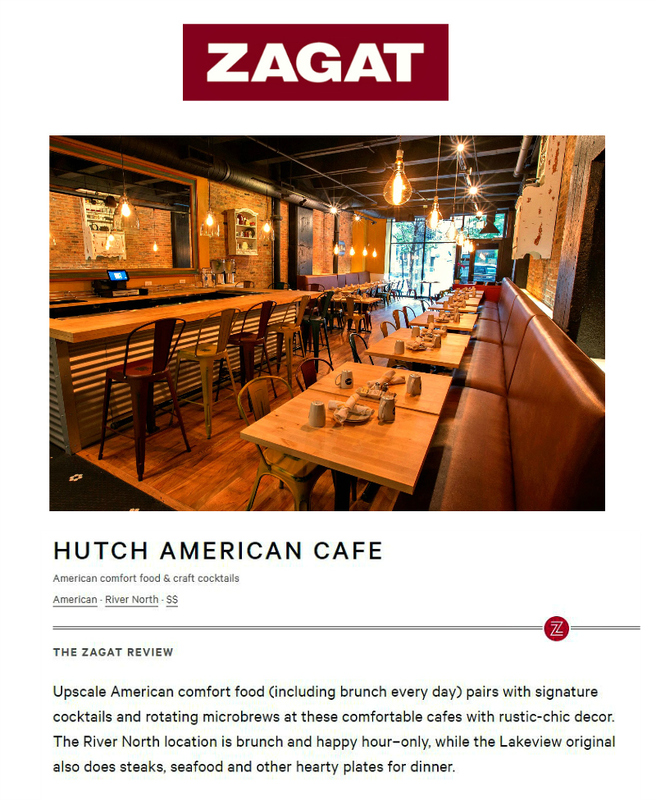 Hutch American Cafe features a line-up of brunch and lunch selections, served 8 a.m. to 3 p.m, 7-days a week. 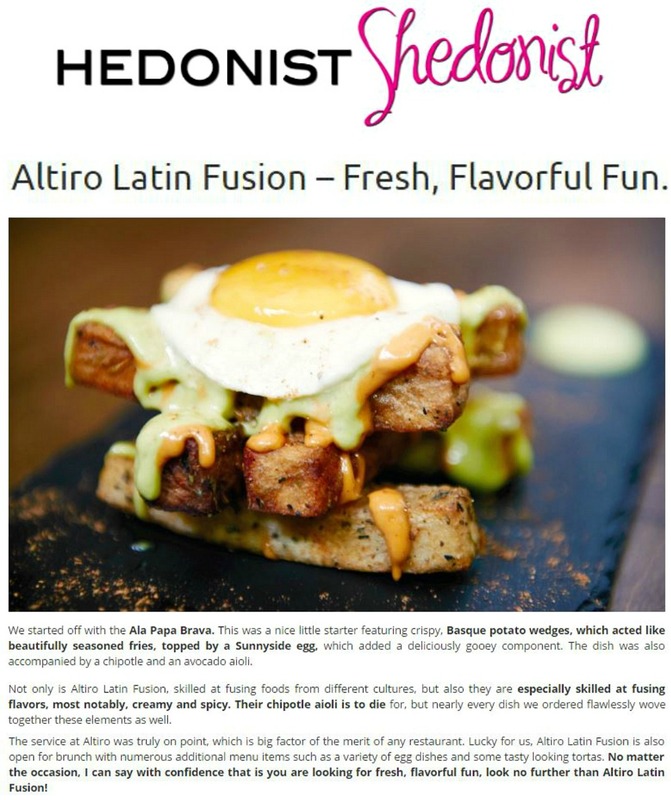 Menu must-trys include Avocado Chicken Toast, Smoked Salmon Eggs Benedict. 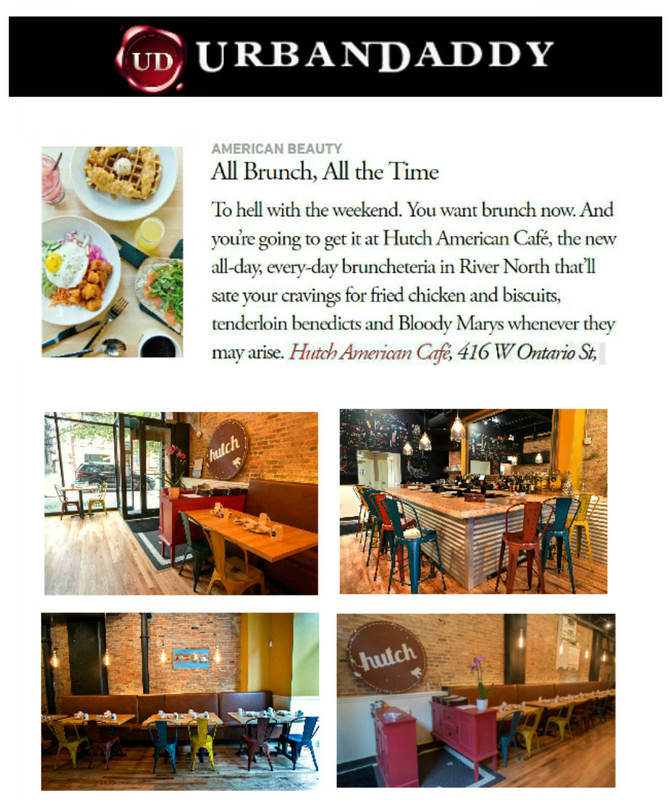 Fried Chicken and Corn Waffle with bacon butter, Lox and Bagel Board, assorted flatbreads, burgers, salads and wraps. 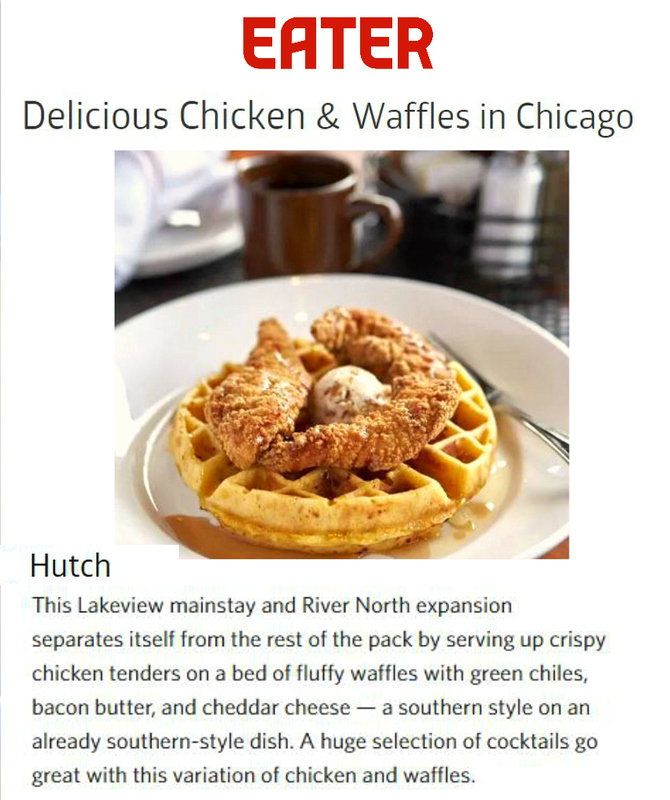 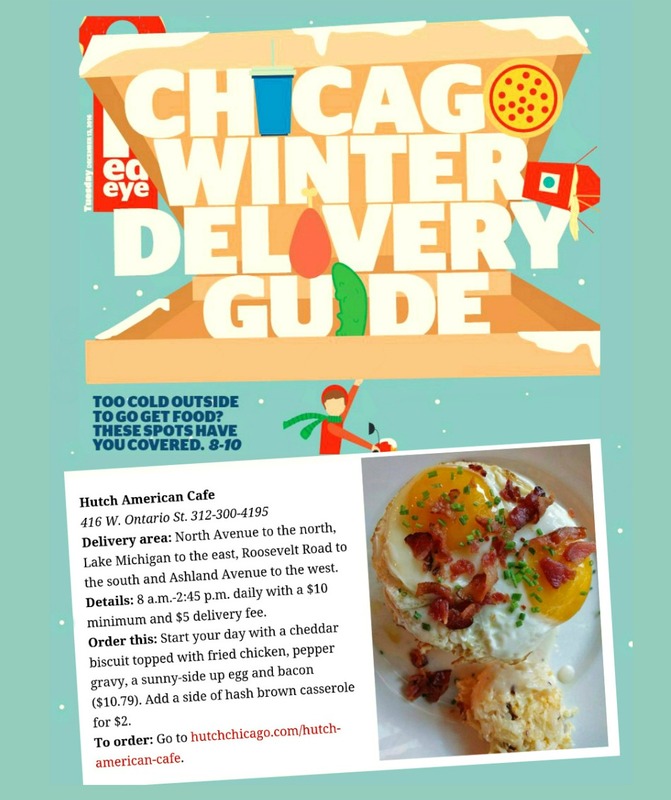 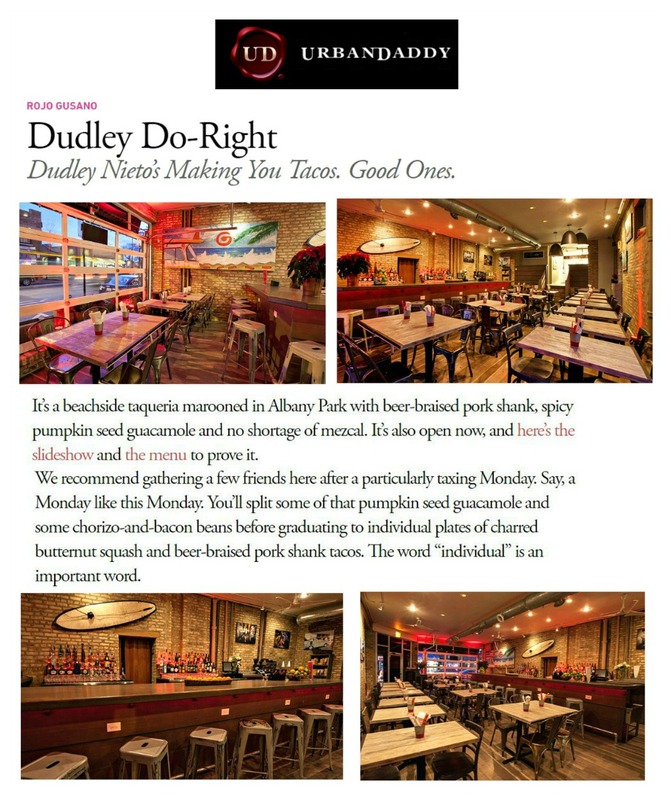 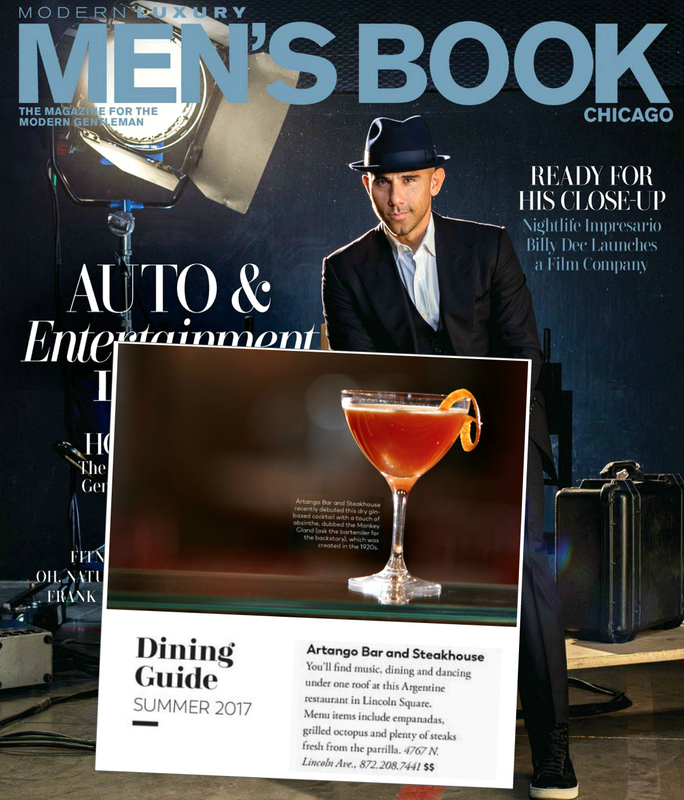 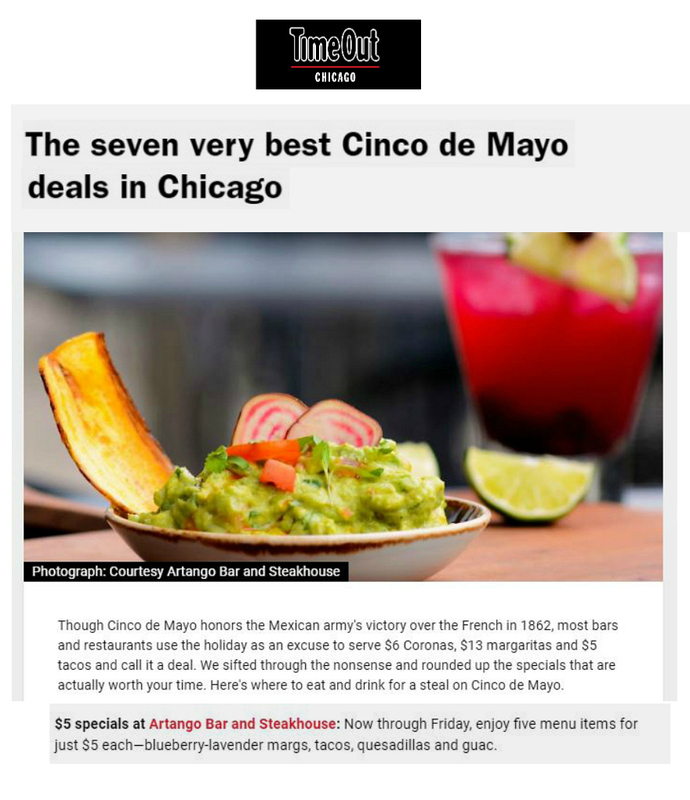 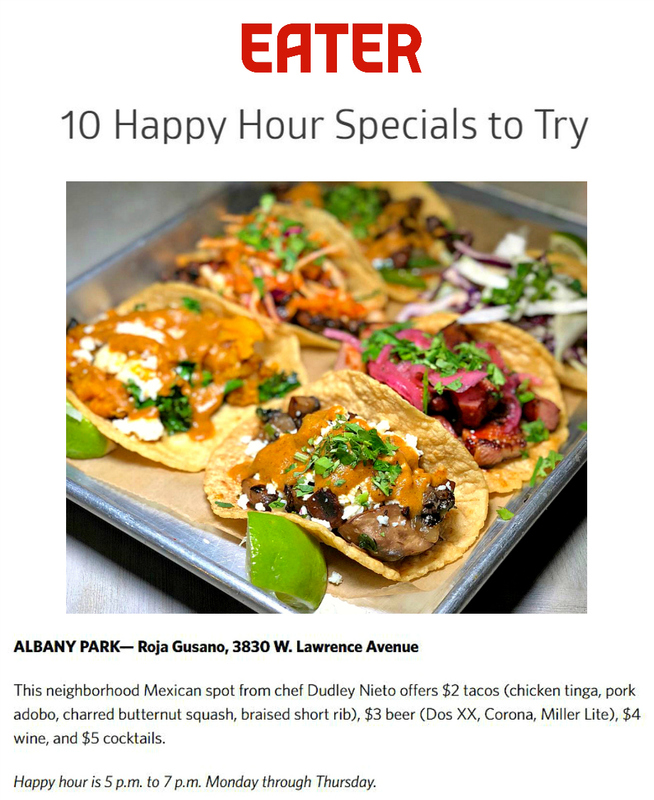 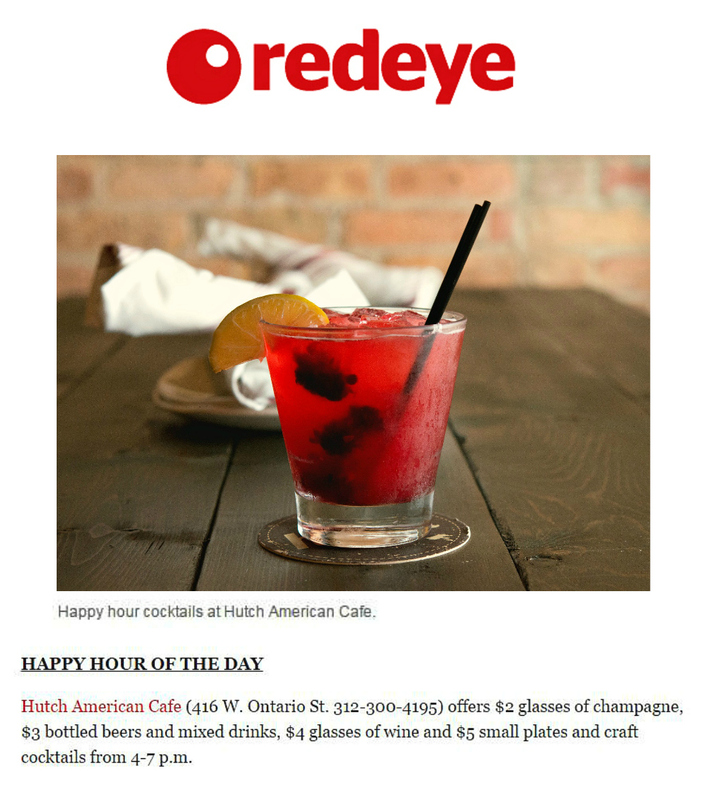 Monday through Friday, from 4pm to 7pm, Hutch American Cafe hosts one of the best Happy Hours deals in River North, with $2 glasses of champagne, $3 beers, and $5 craft cocktails. 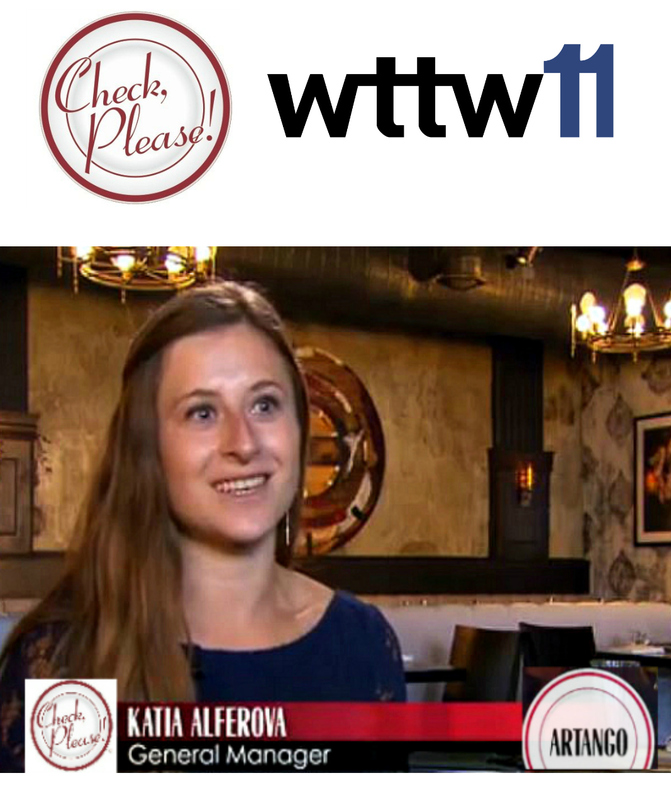 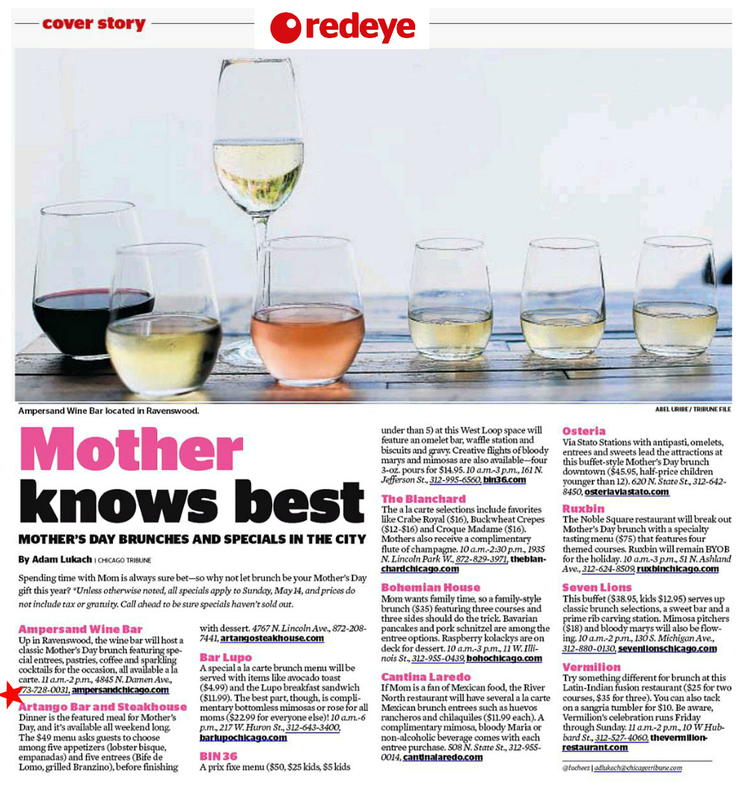 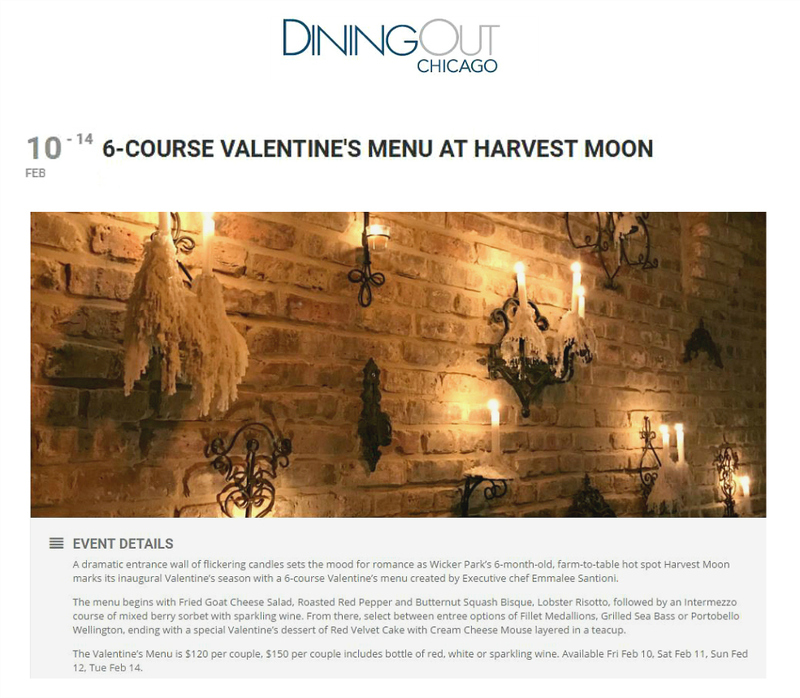 During that time, a special menu of snacks and small plates is offered, including Smoked Salmon Flatbread, house made Tater Tots with truffle cheese fondue and more, each priced at just $5. 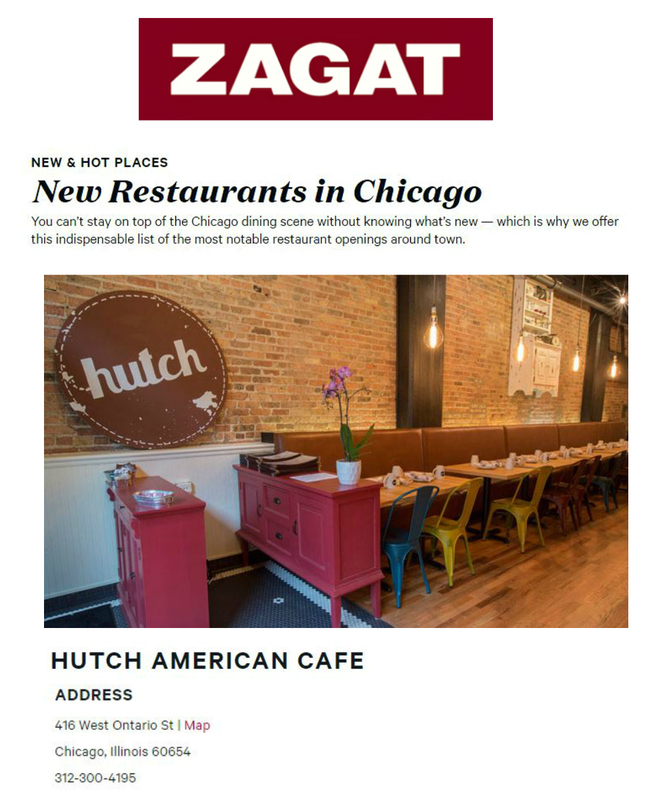 Hutch American Cafe, 416 West Ontario, Chicago. 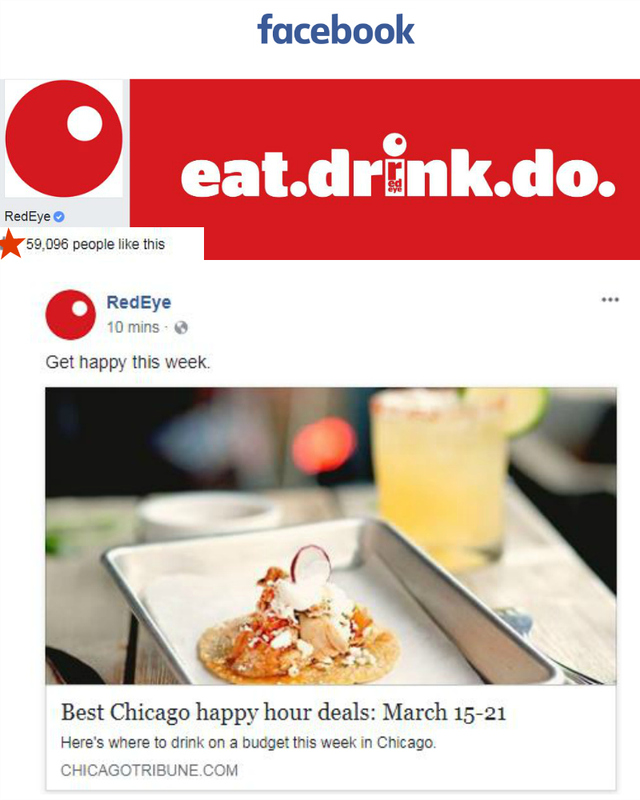 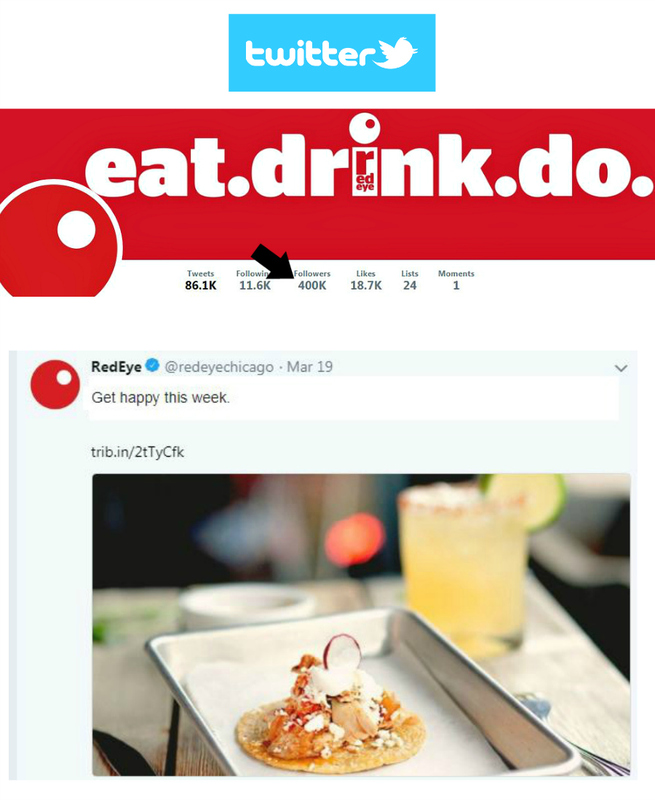 312-300-4195. 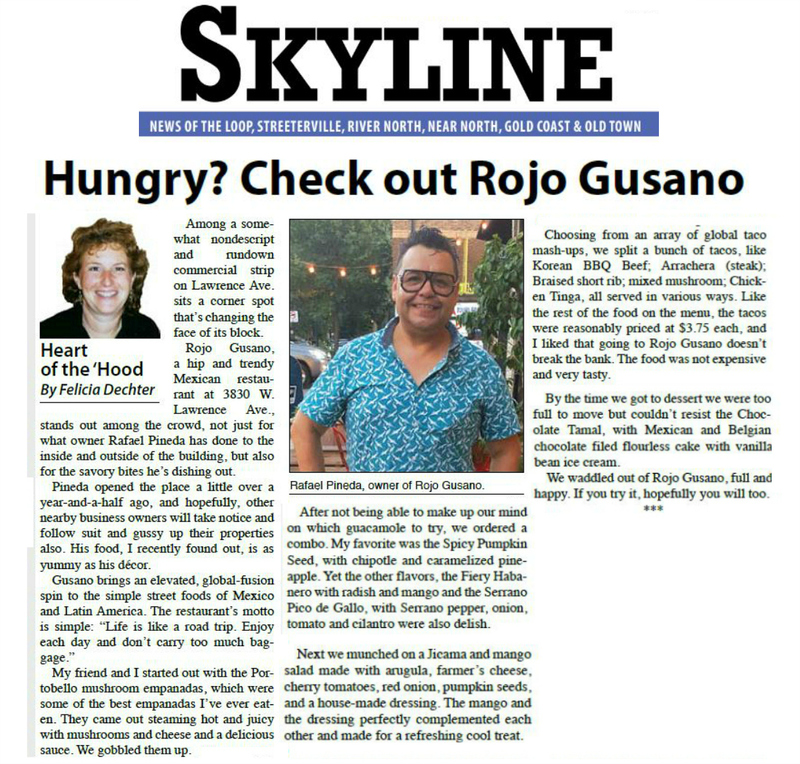 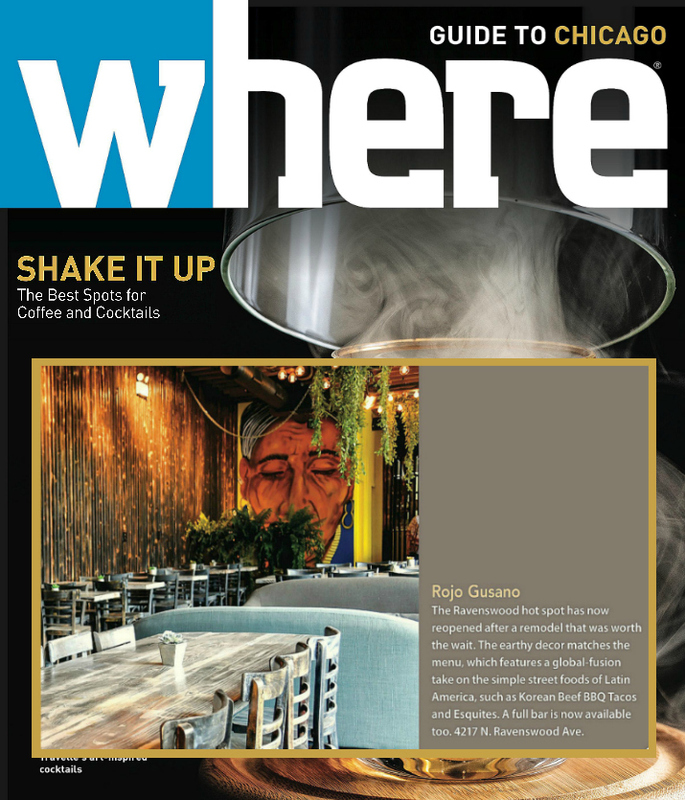 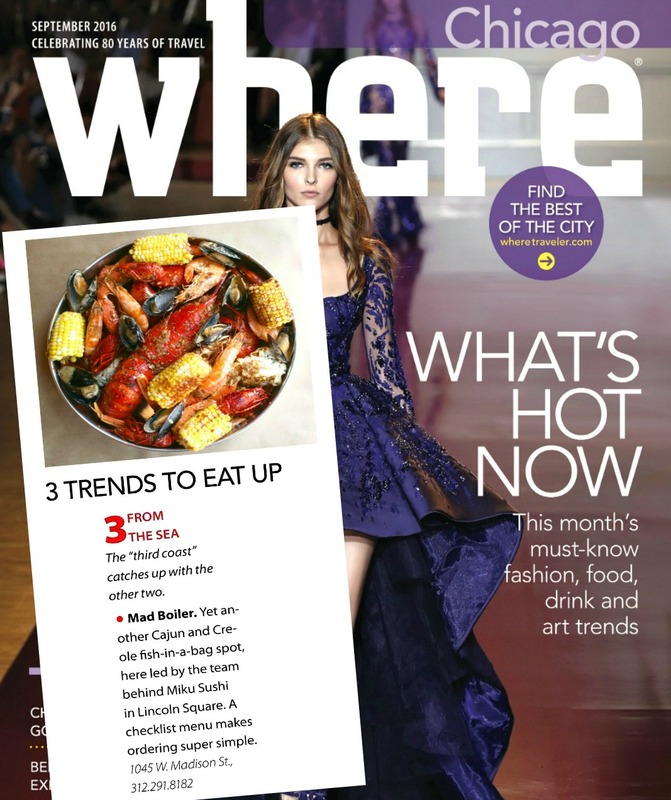 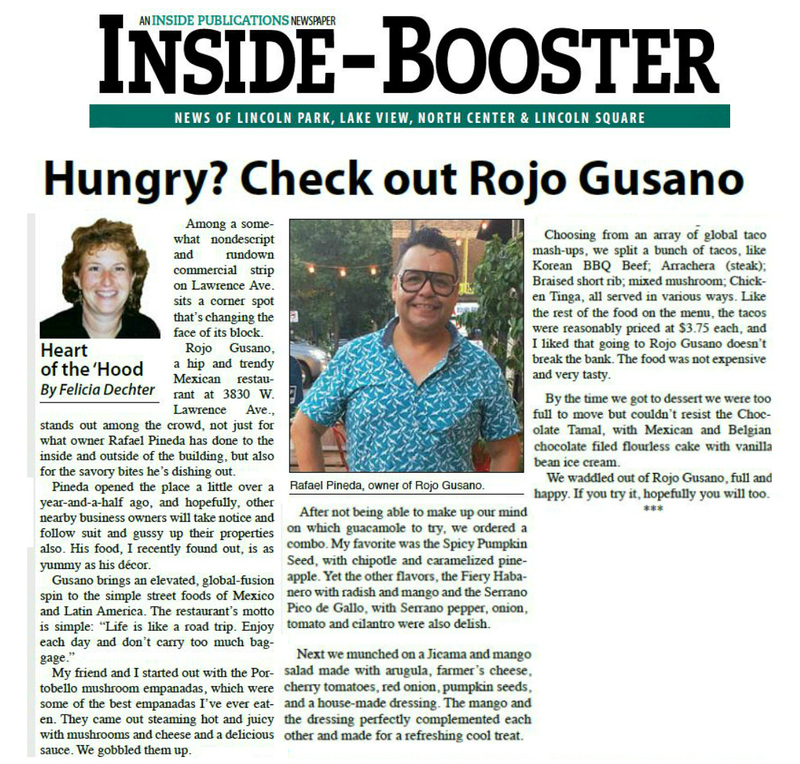 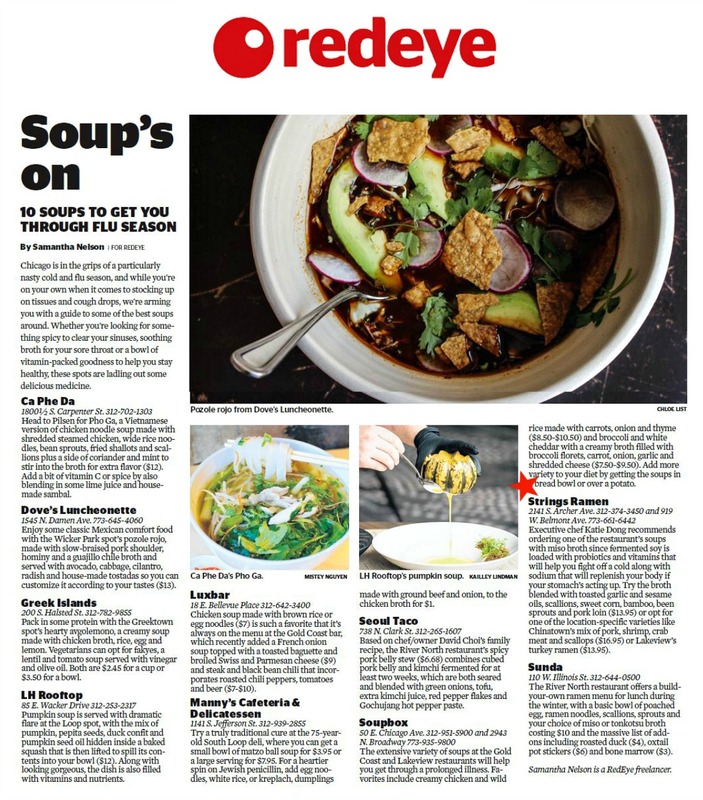 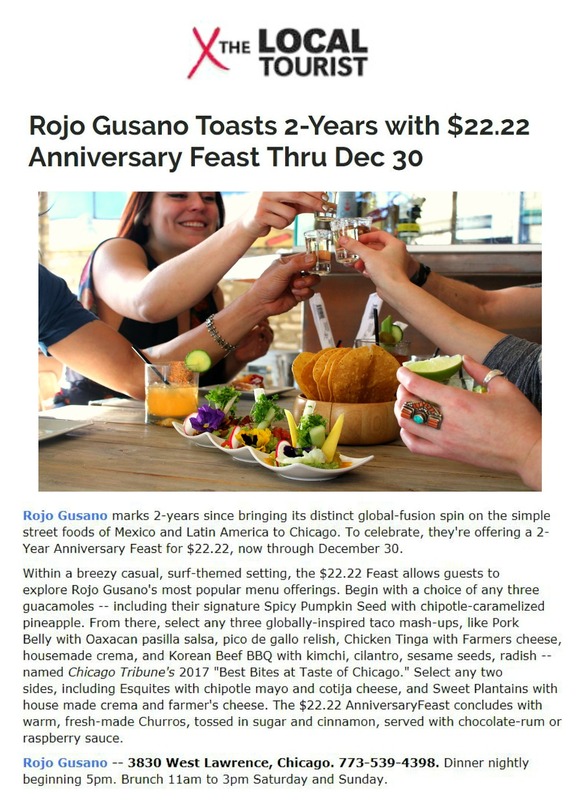 Globe-trotting chef Dudley Nieto’s Rojo Gusano puts an elevated, global-fusion spin on the simple street foods of Mexico and Latin America, served in a breezy casual, surf themed setting. 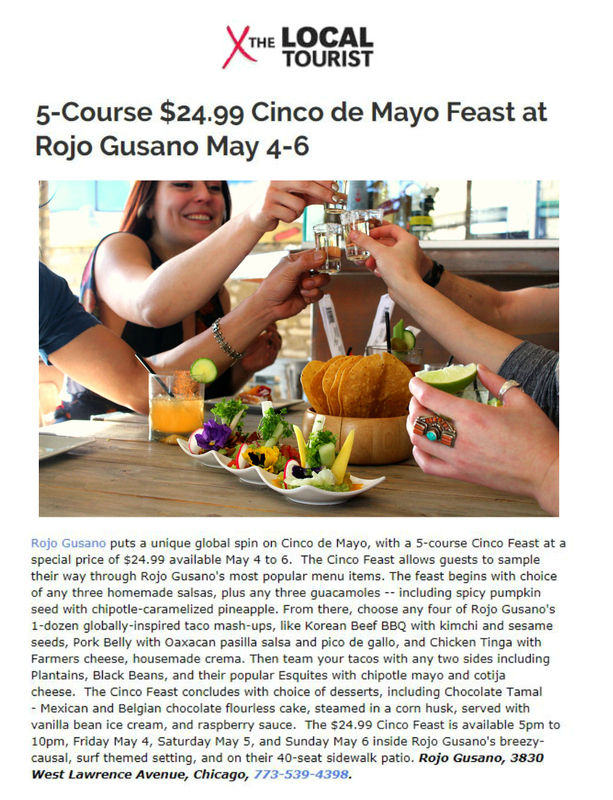 Must-trys include starters like guacamole with spicy pumpkin seeds and caramelized pineapple. 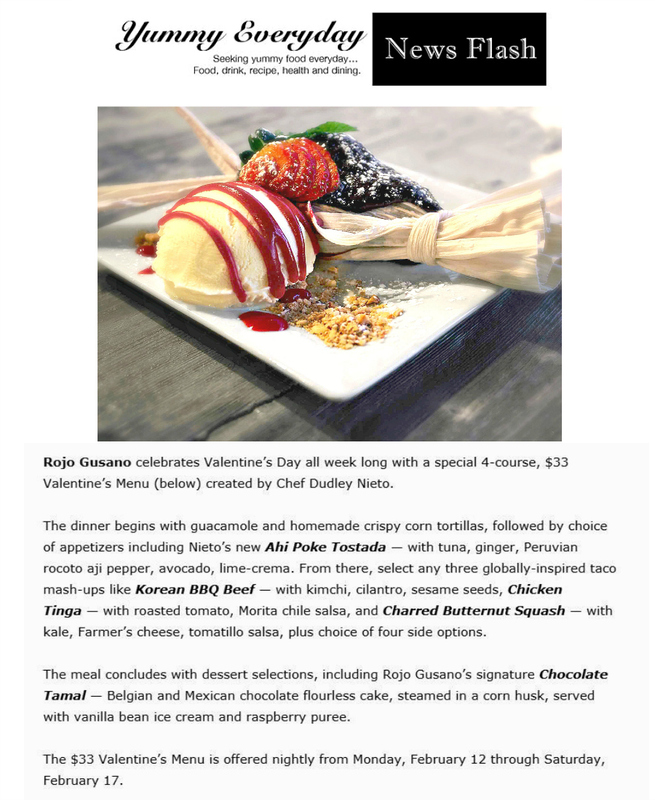 Ceviche Mixto, with octopus, shrimp, sweet potato, toasted cancha corn. 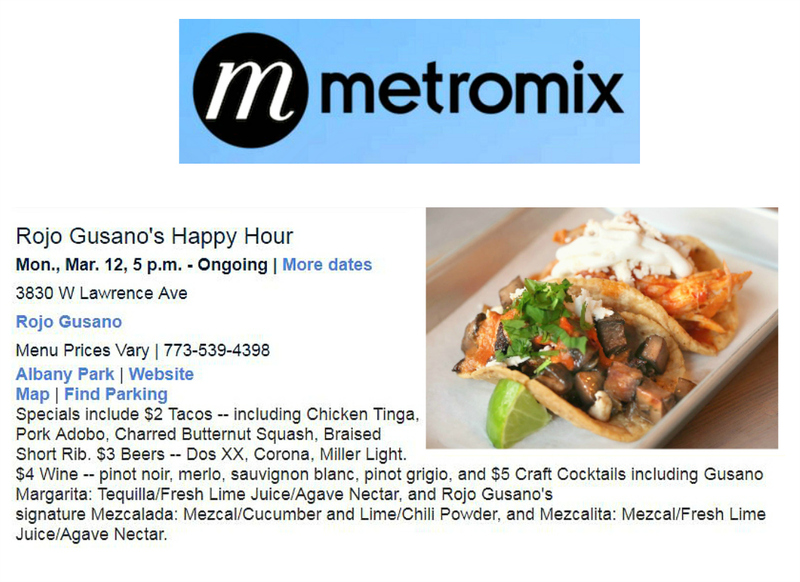 Homemade empanadas with Portobello mushrooms or chicken tinga fillings. 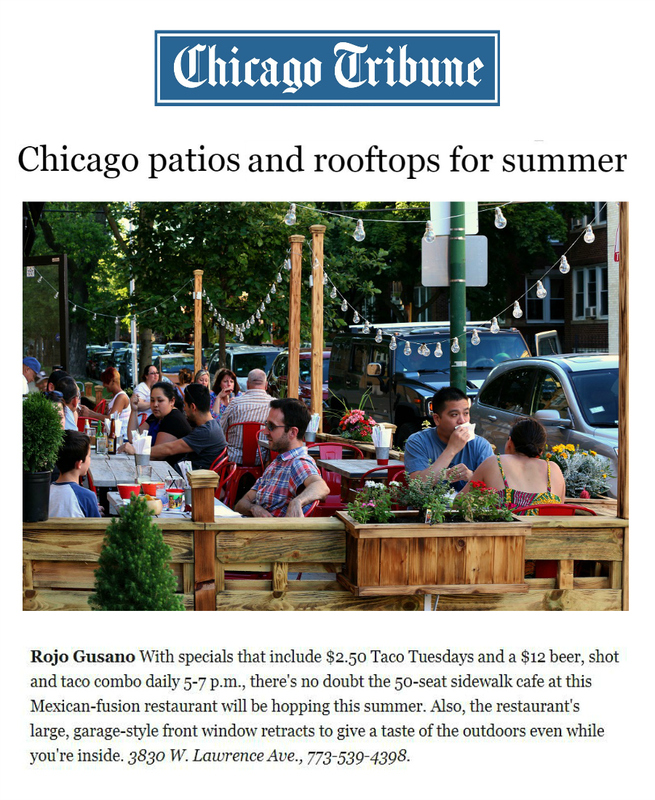 Choose from one-dozen global taco mash-ups, like Green Curry Shrimp with Asian cabbage, Pork Belly with red pickled onion, Chicken Tinga with Farmers cheese, along with sides like Esquites with cotija cheese, piguin chile and chipotle mayo, and Sweet Plantains with house-made crema. 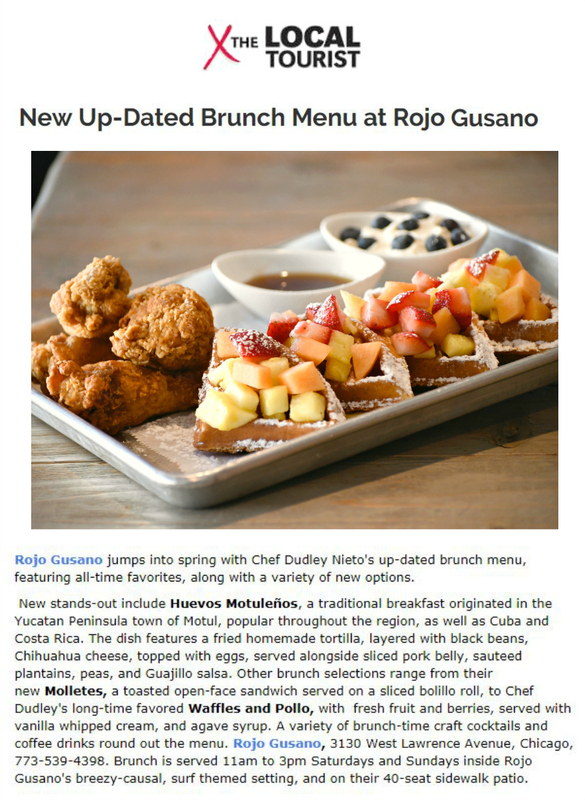 Weekend brunch ranges from Chilakillers with salsa, Asadero cheese, choice of eggs, to Huevo Sandwich with Nueske’s Applewood-smoked bacon, and Rojo Gusano’s signature Pollo and Waffles — spicy marinated fried chicken, waffles, fresh fruit, served with vanilla whipped cream, and Agave syrup. 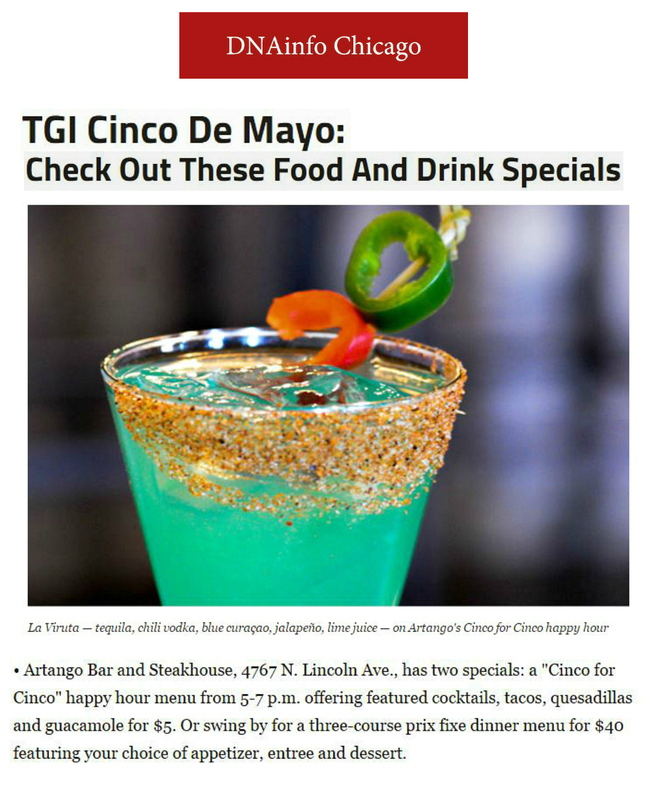 Full bar service, including an expansive selection of tequilas, mezcals, and craft cocktails is available. 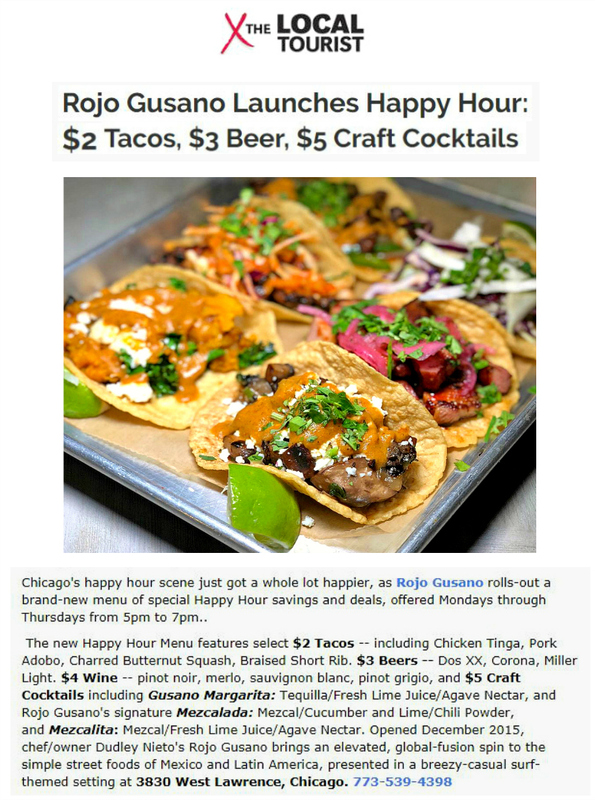 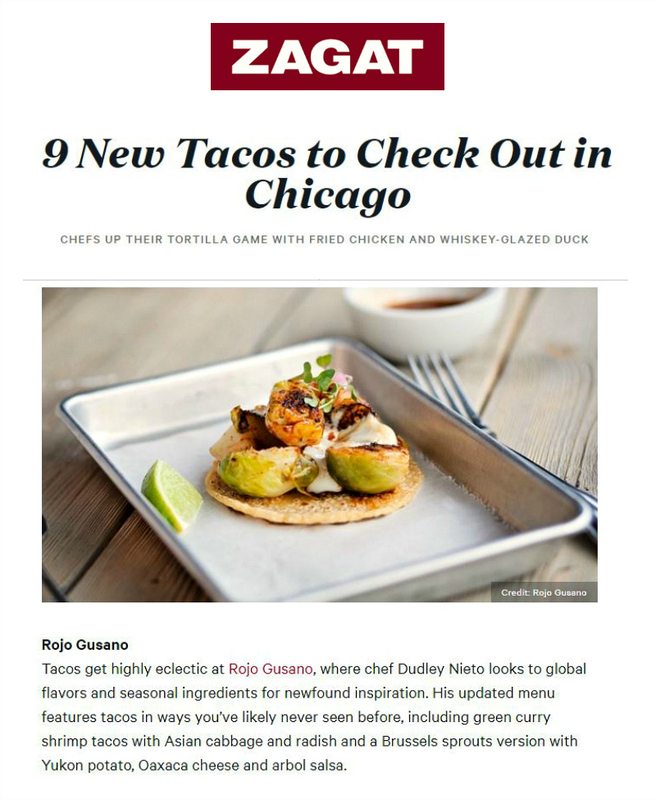 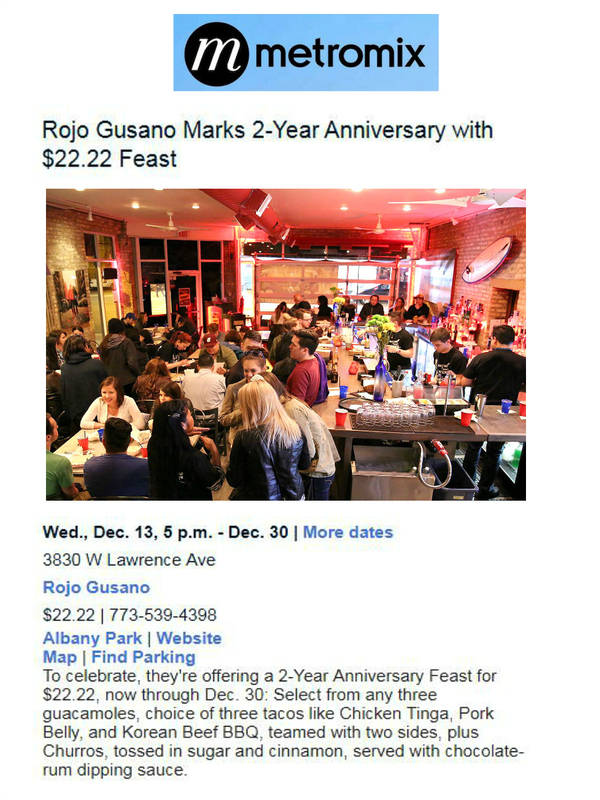 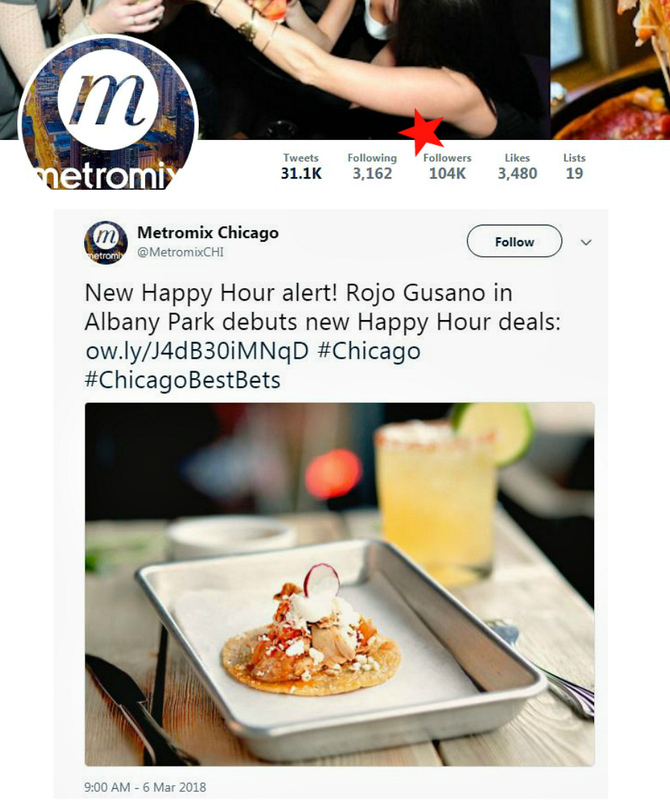 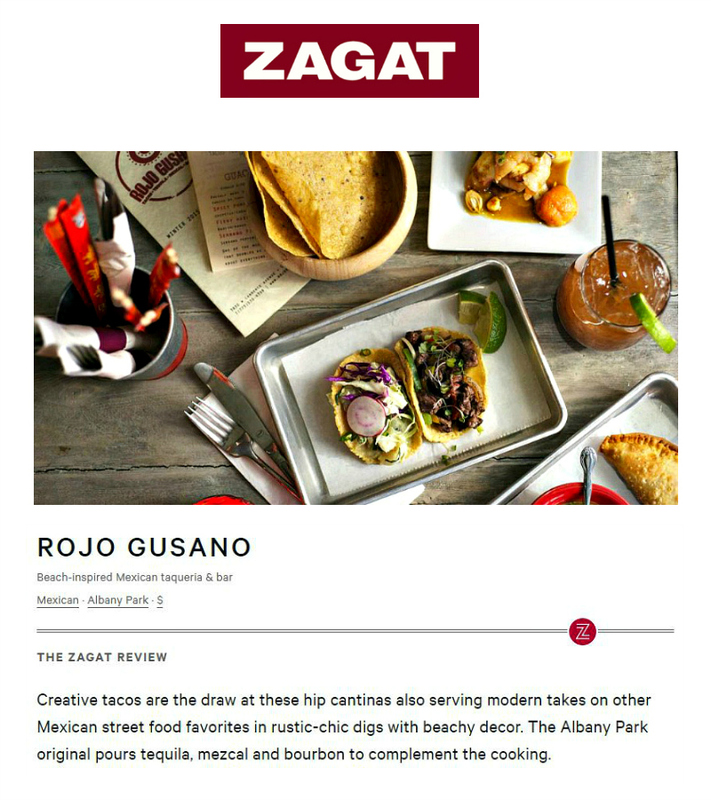 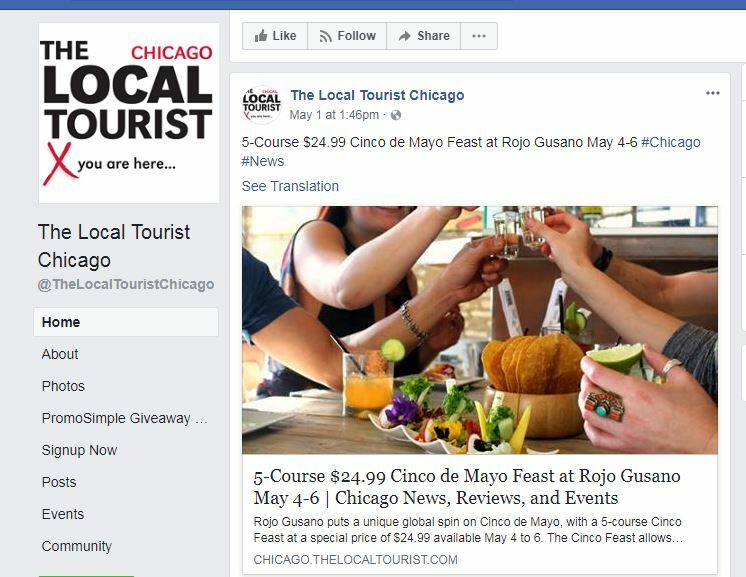 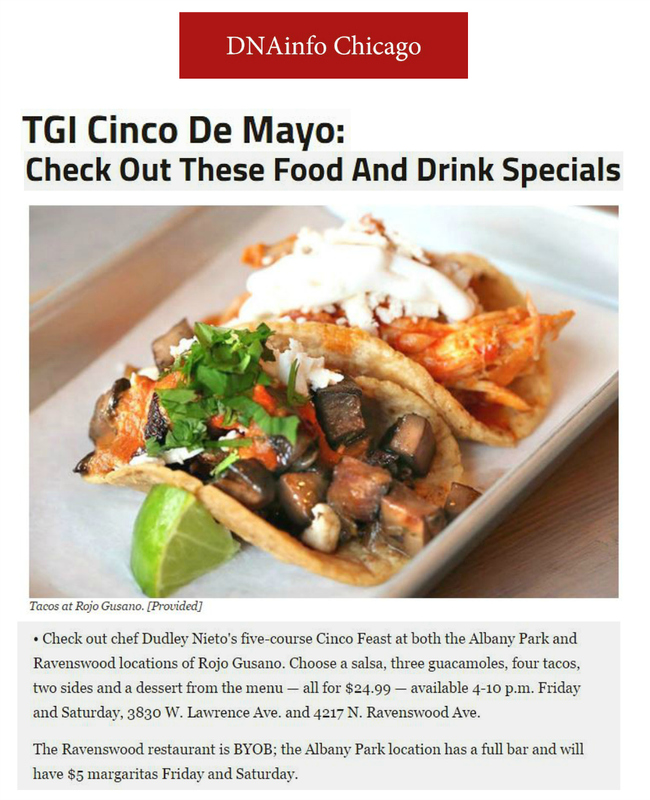 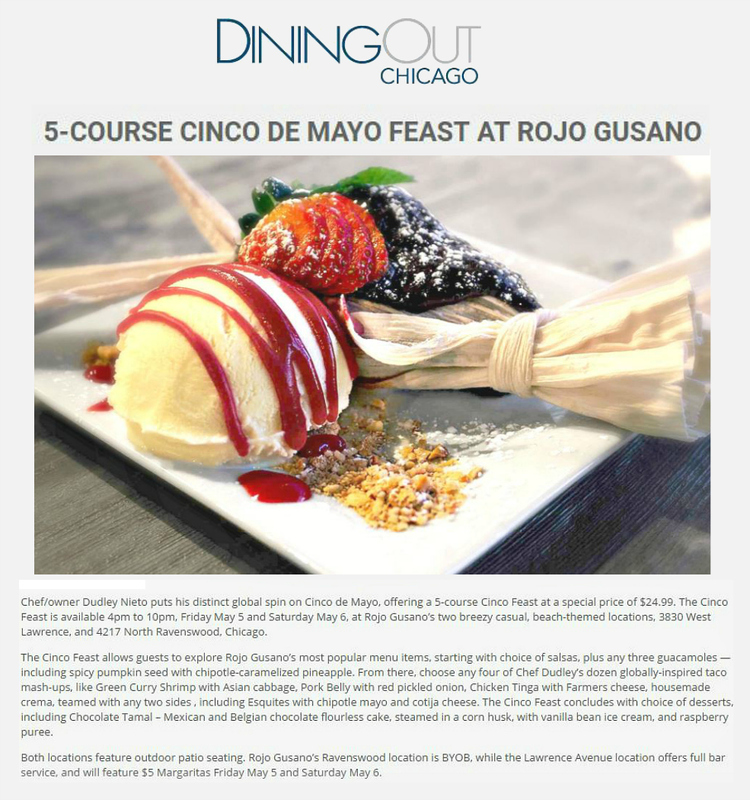 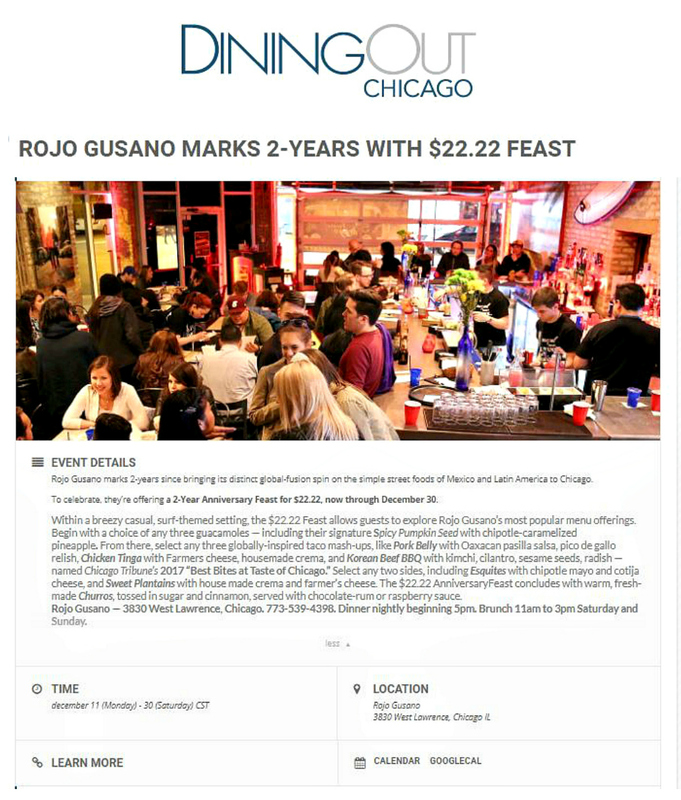 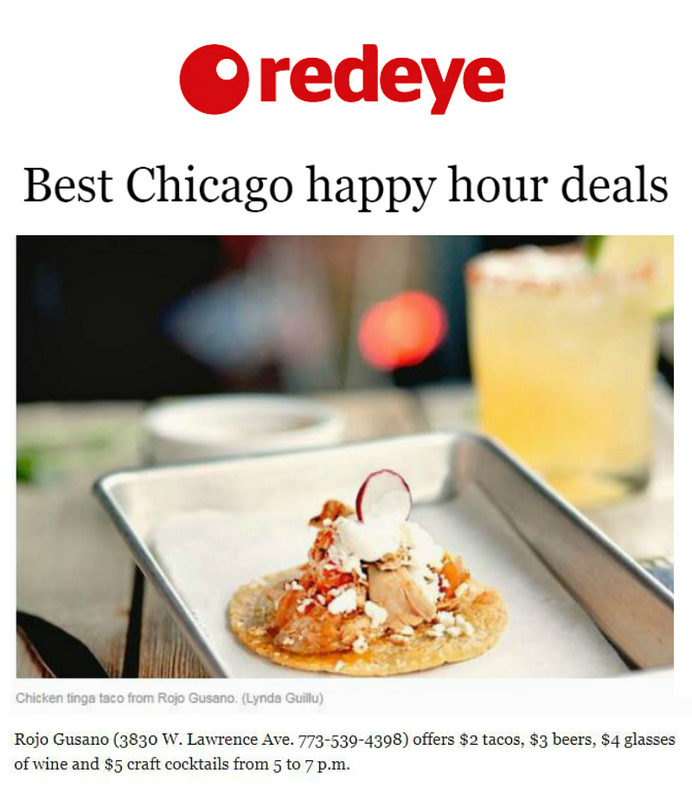 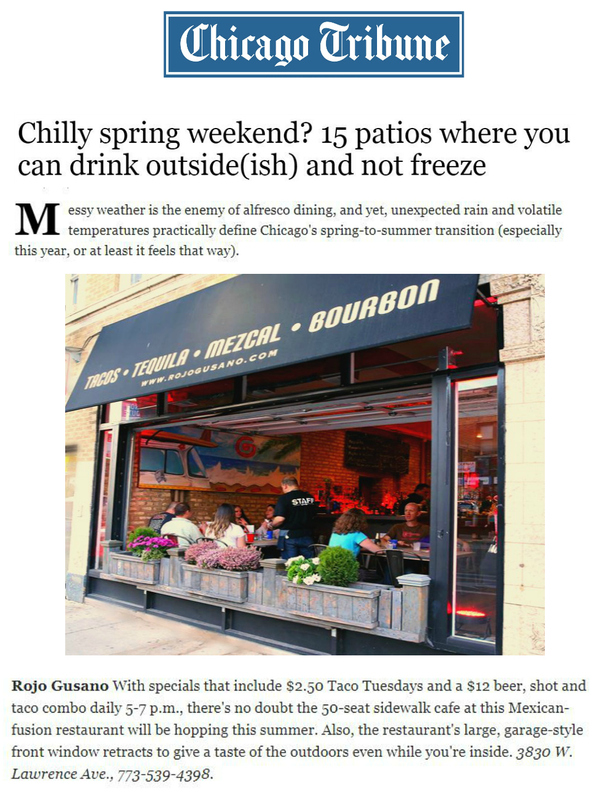 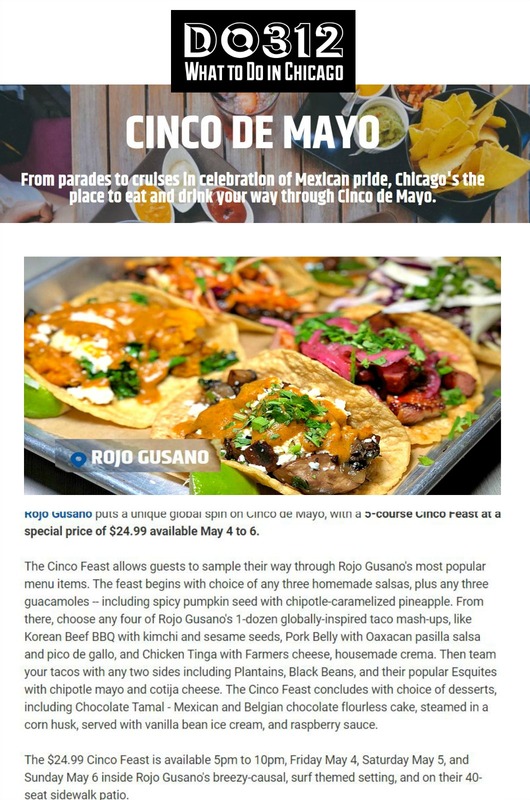 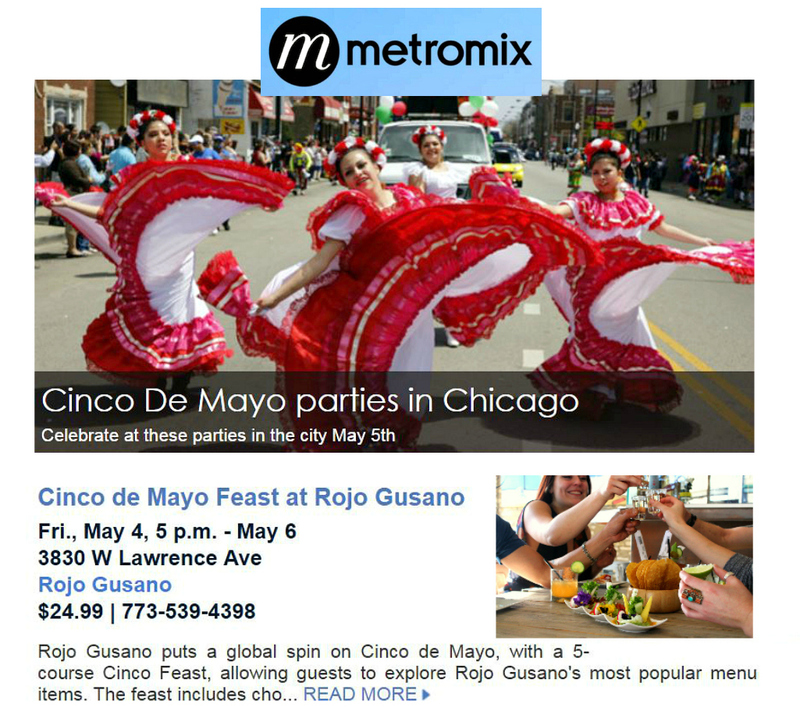 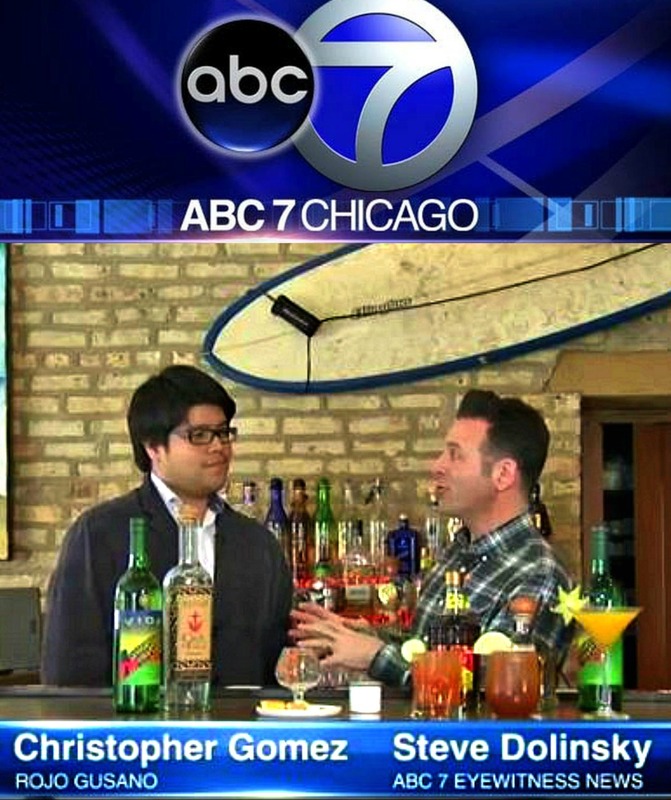 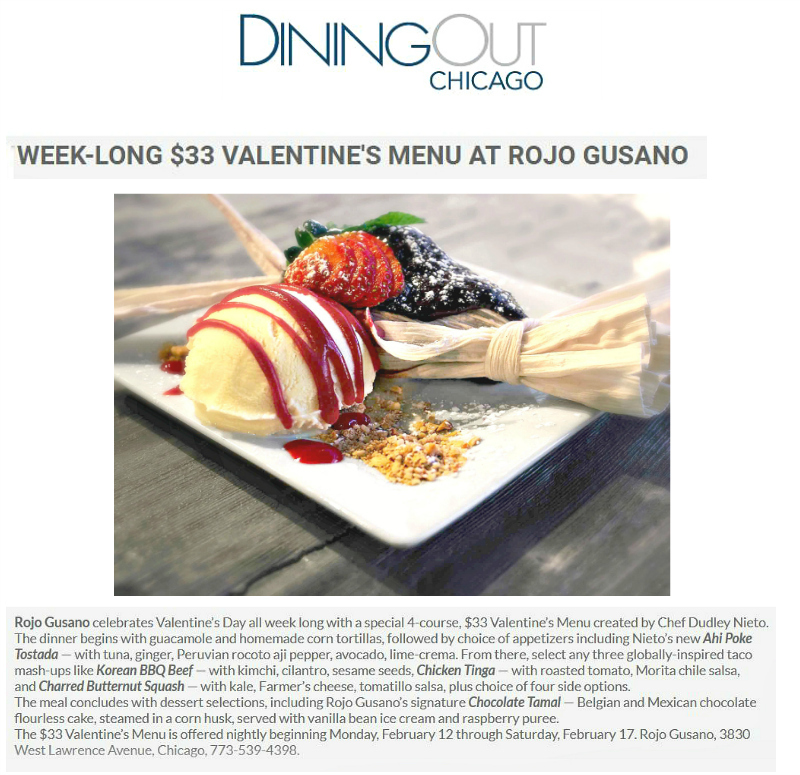 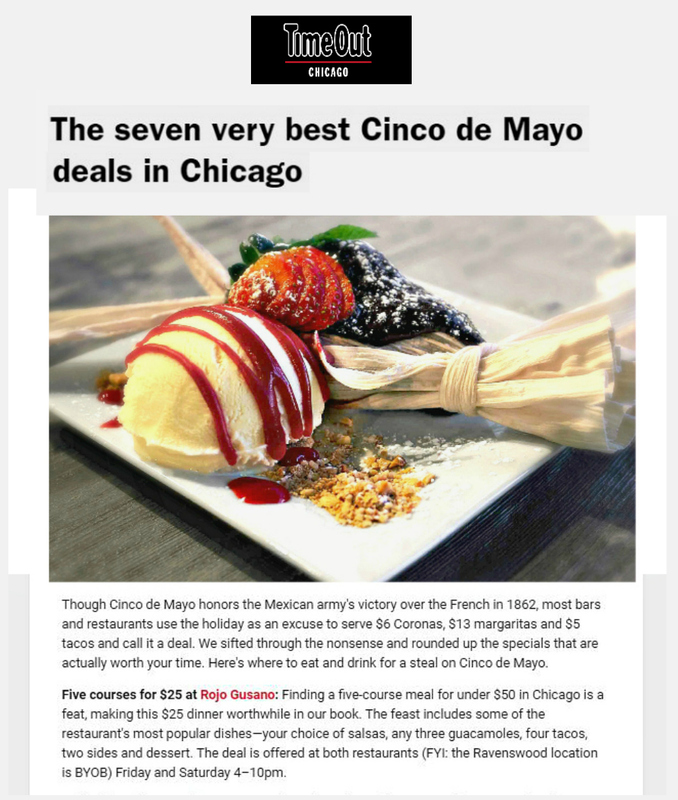 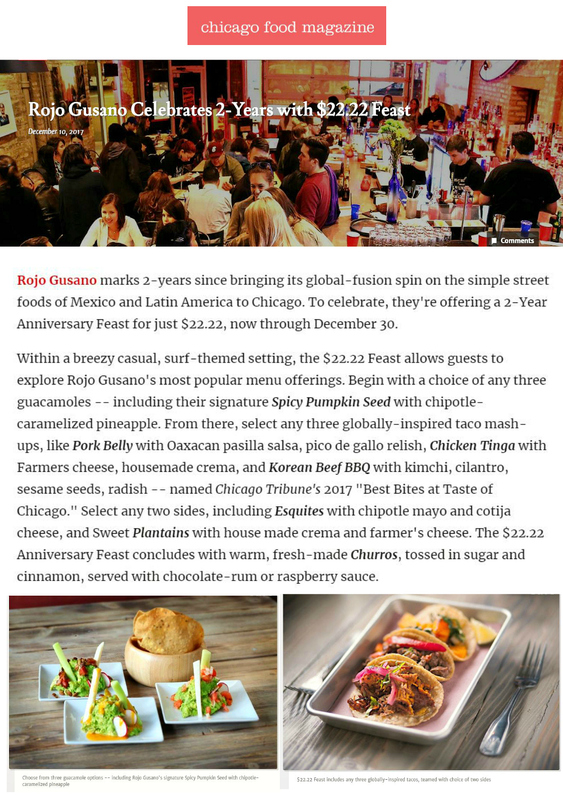 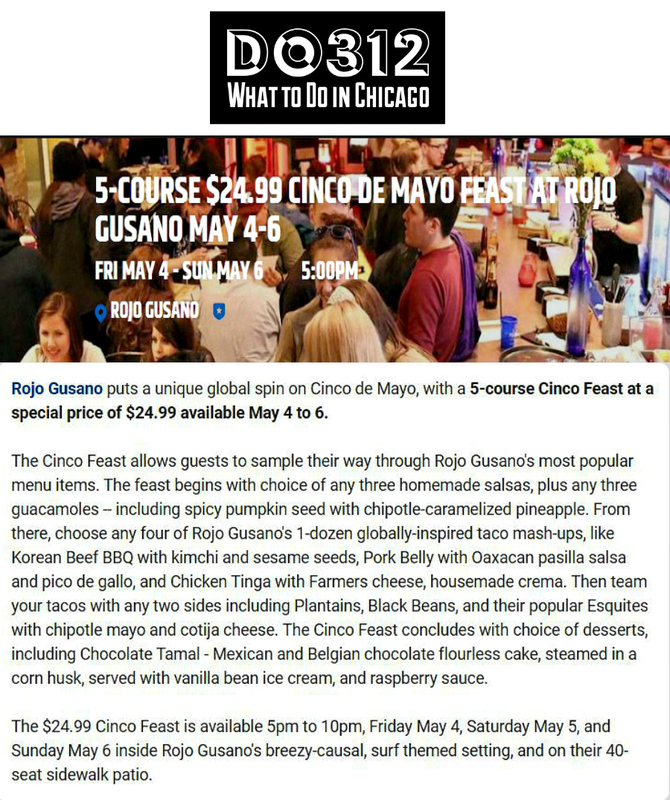 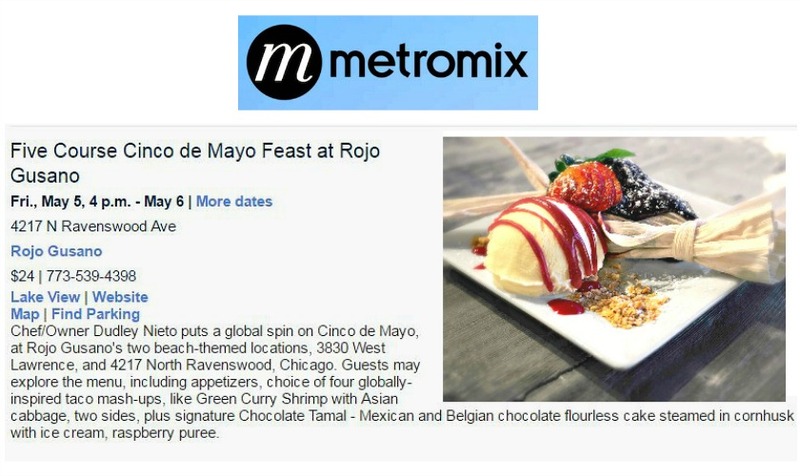 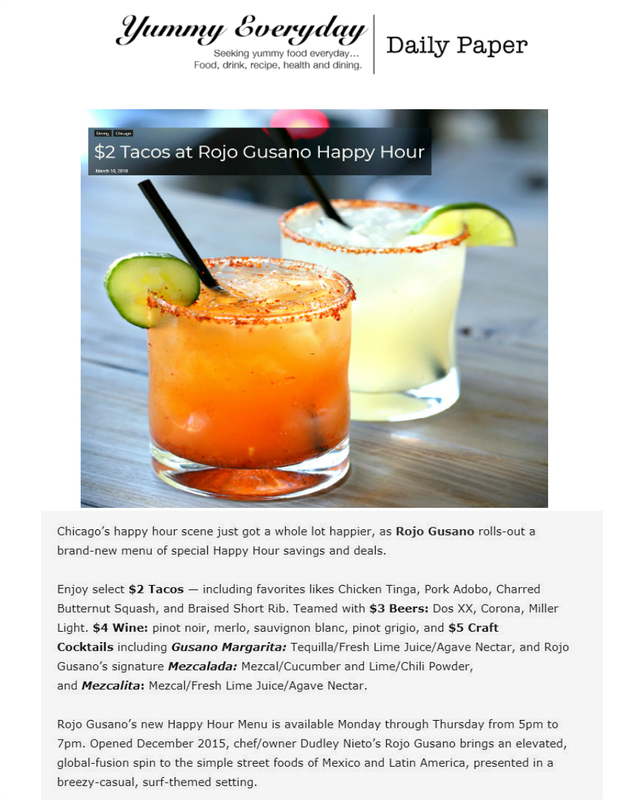 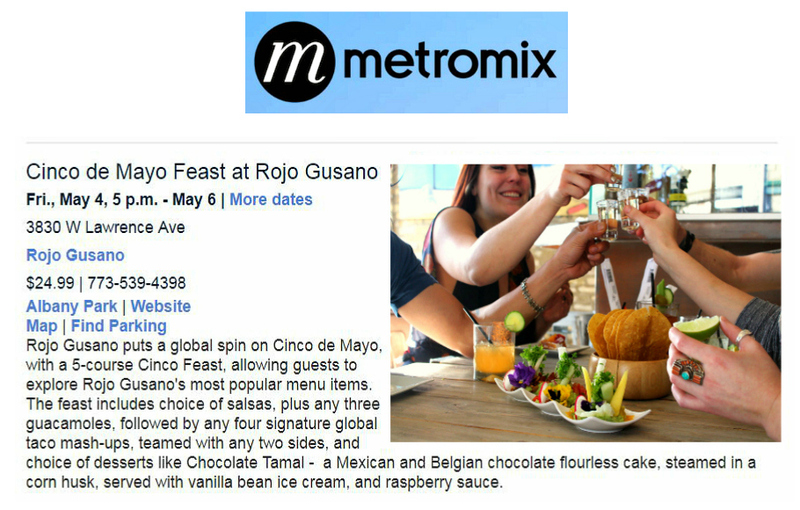 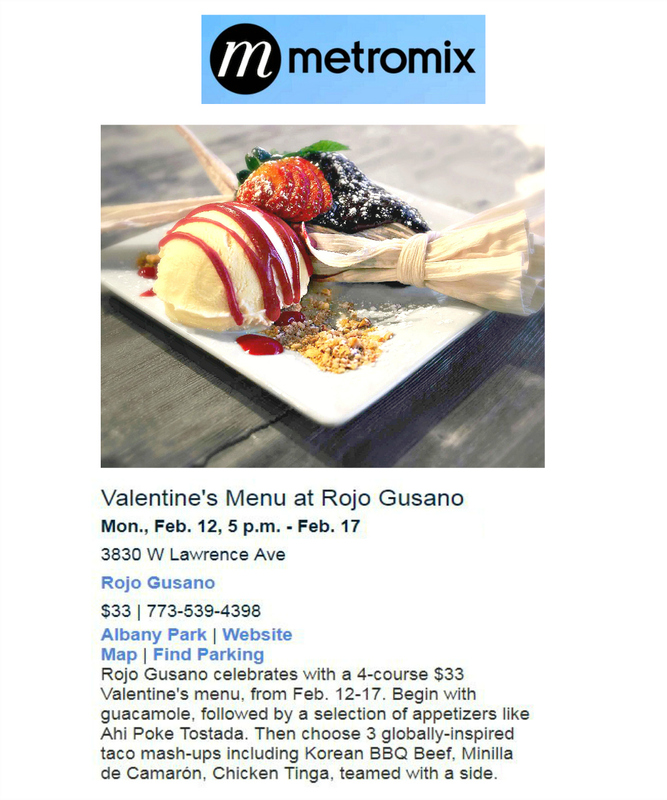 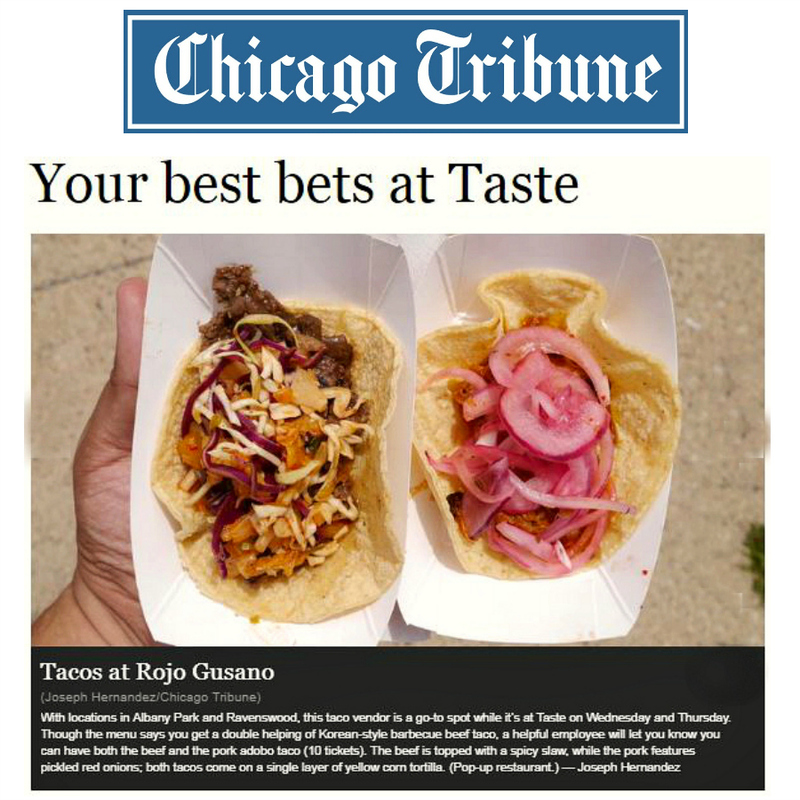 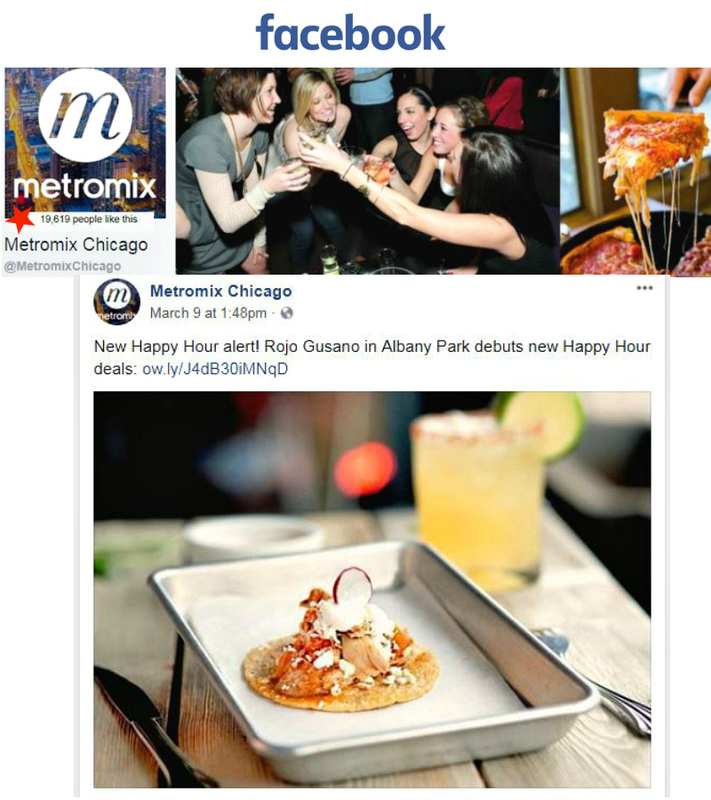 Rojo Gusano, 3830 West Lawrence Avenue, Chicago, 773-539-4398. 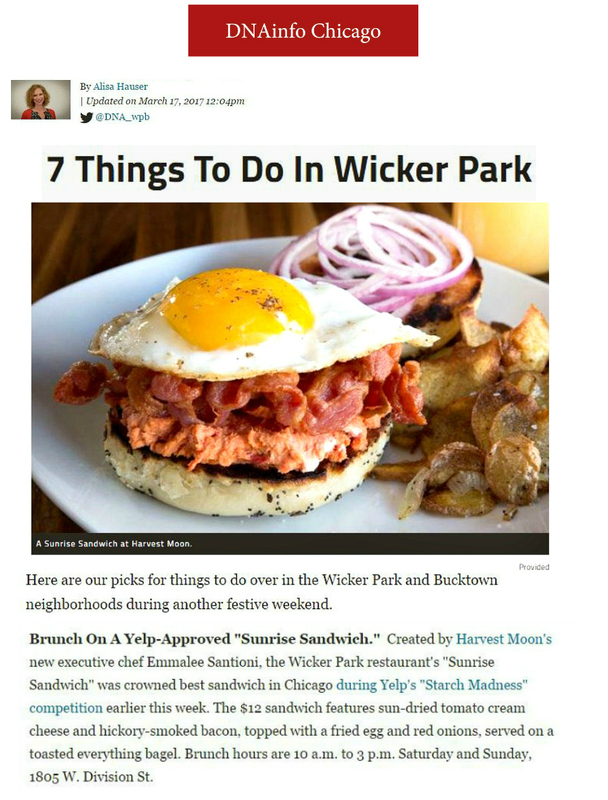 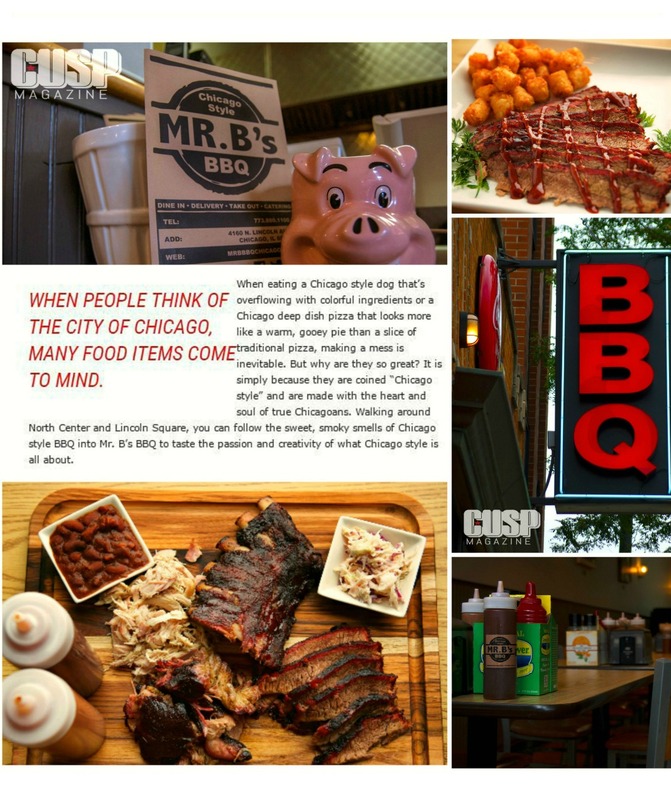 What’s the best sandwich in Chicago these days? 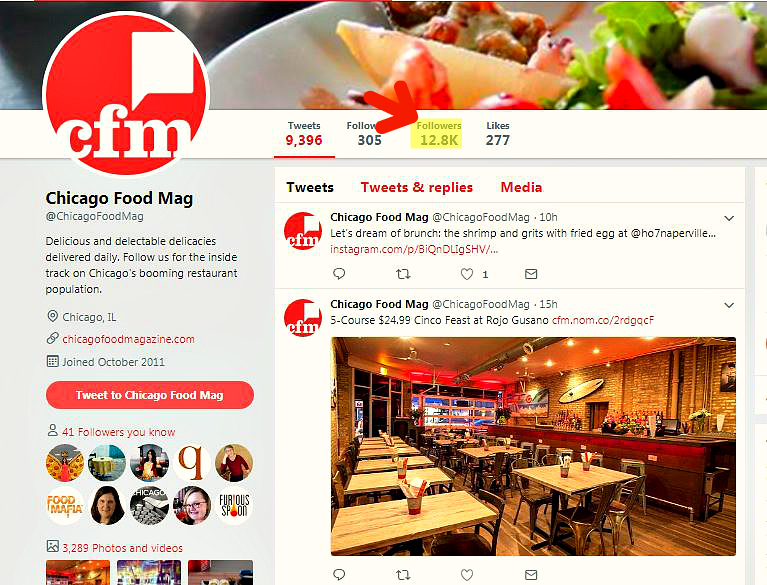 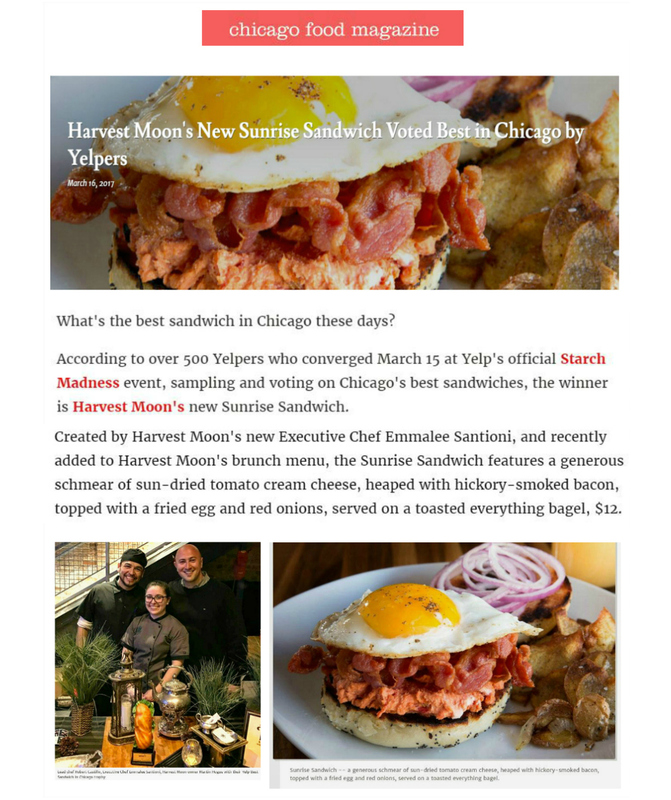 According to over 500 Yelpers, who converged at Yelp-sponsored Starch Madness to taste-test and vote on Chicago’s best sandwich, the winner is Harvest Moon’s new Sunrise Sandwich. 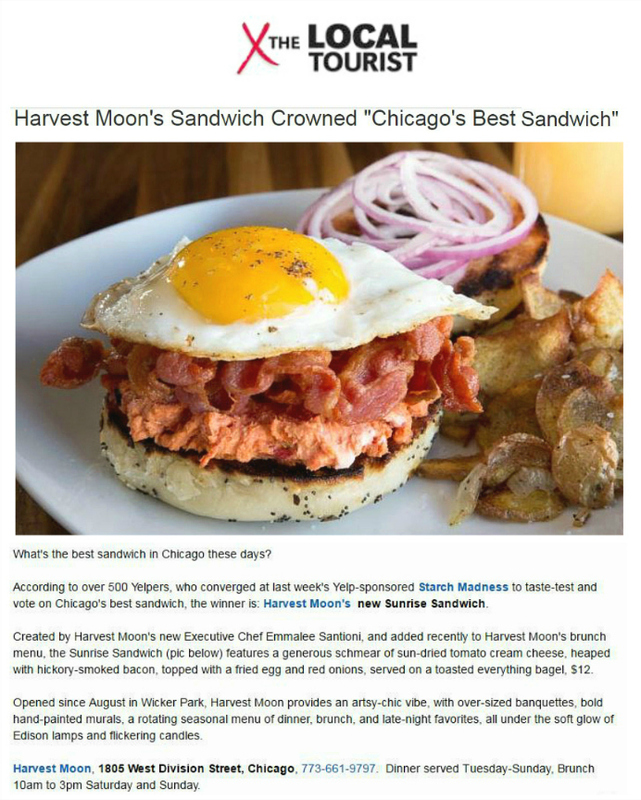 Created by Harvest Moon’s Executive Chef Emmalee Santioni, and added recently to Harvest Moon’s brunch menu, the Sunrise Sandwich begins with a generous schmear of sun-dried tomato cream cheese, heaped with hickory-smoked bacon, topped with a fried egg and red onions, served on a toasted everything bagel, $12. 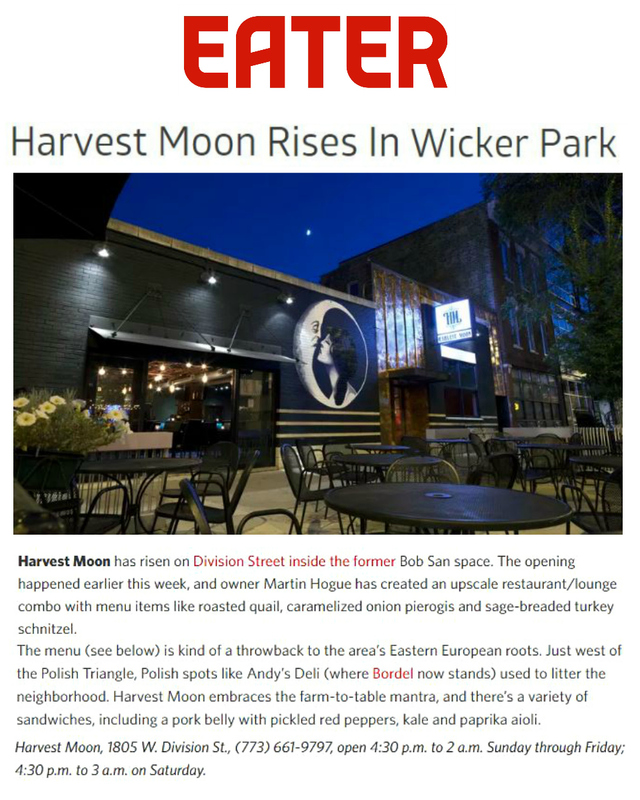 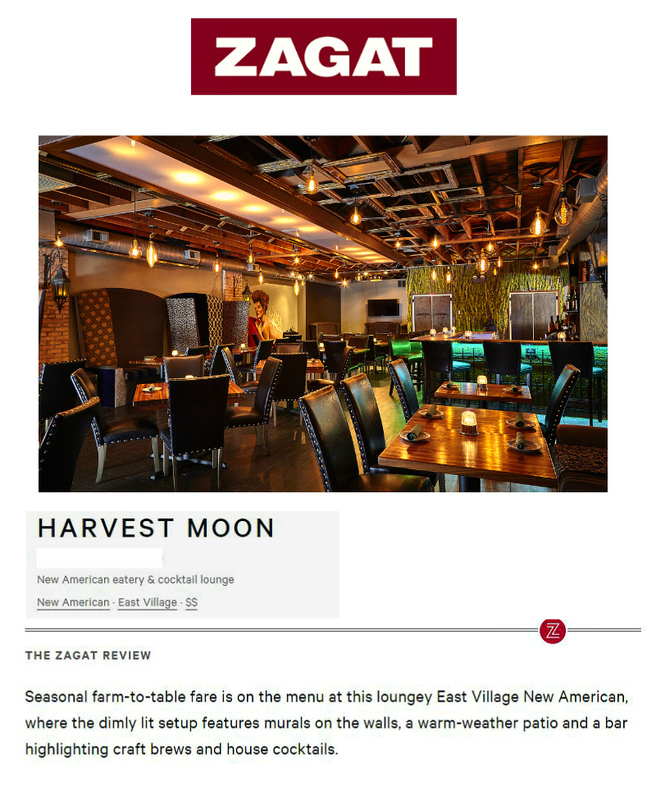 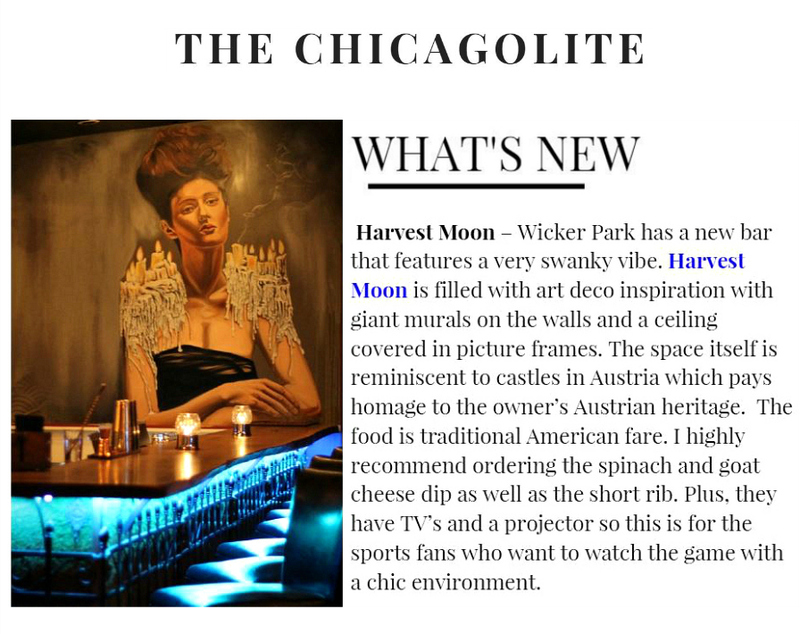 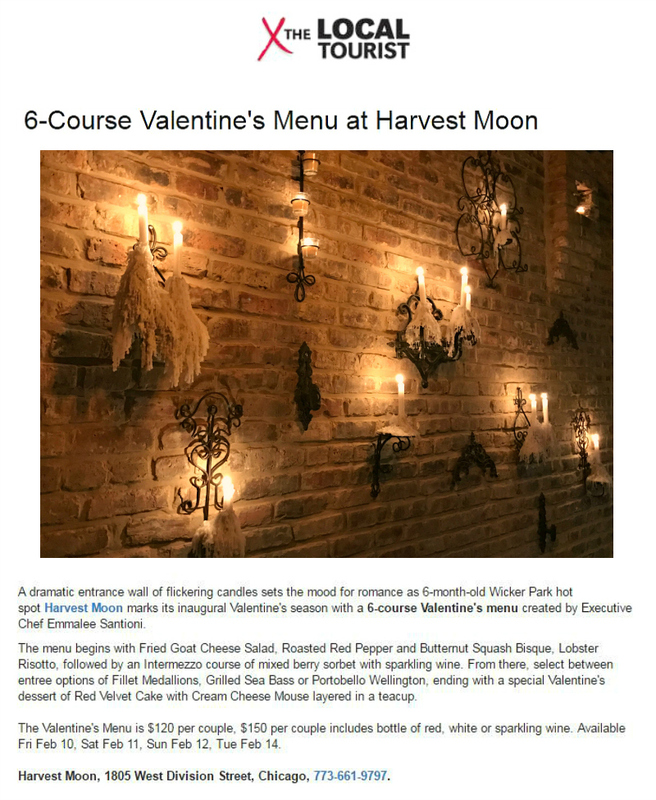 Opened since August in Wicker Park, Harvest Moon provides an artsy-chic vibe, with over-sized banquettes, bold hand-painted murals, a rotating seasonal menu of dinner, brunch, and late-night favorites, all under the soft glow of Edison lamps and flickering candles. 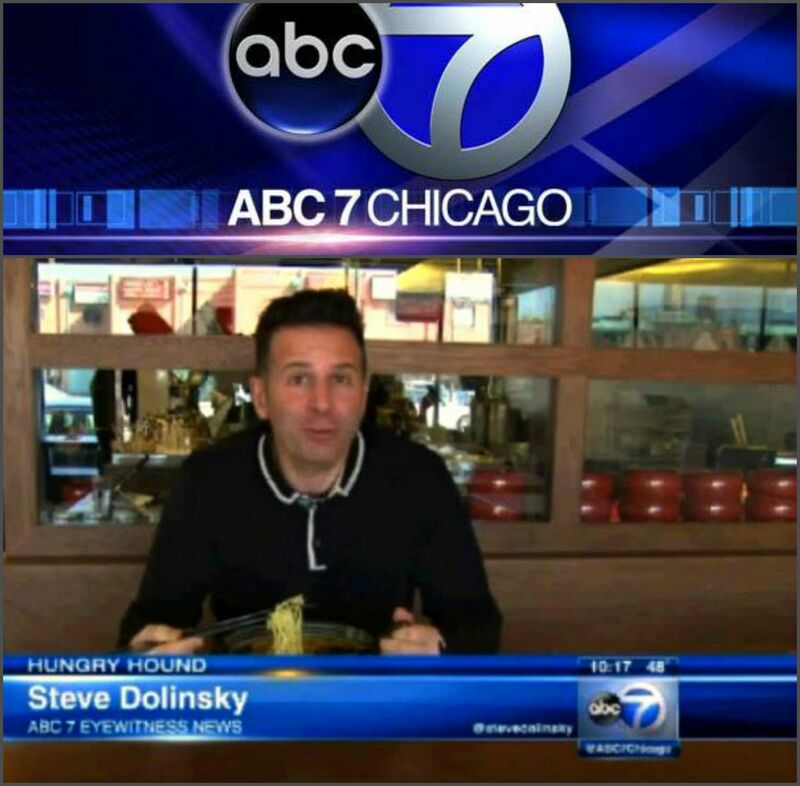 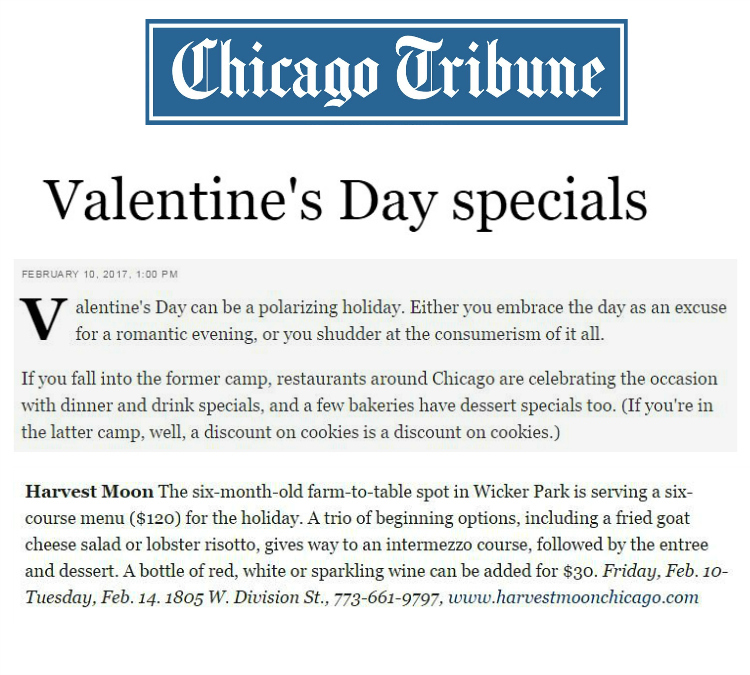 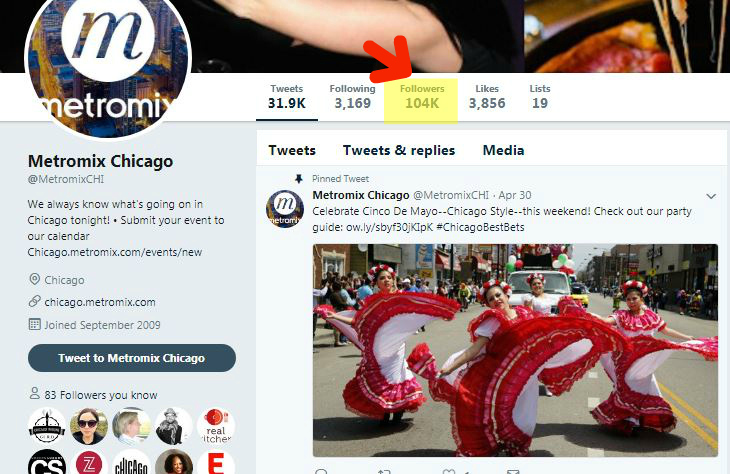 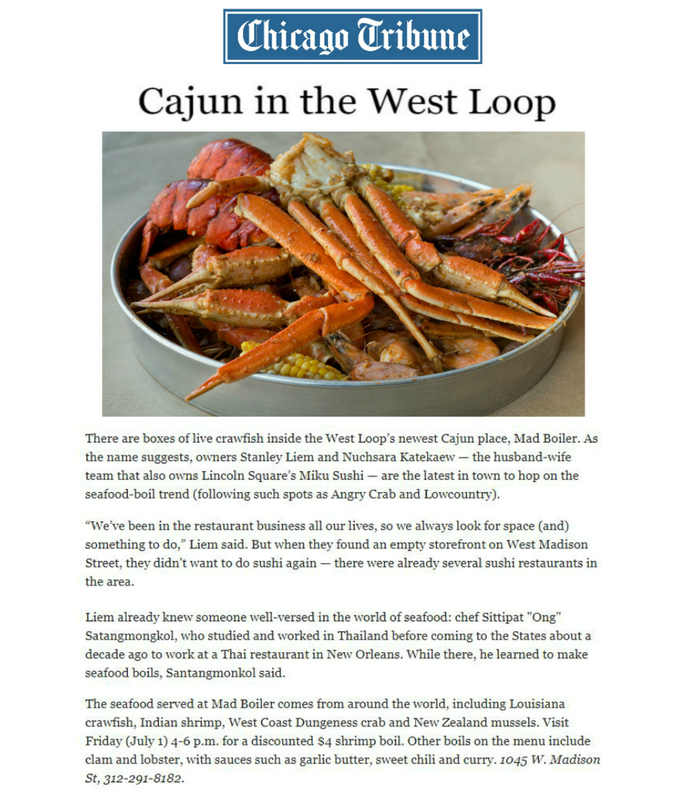 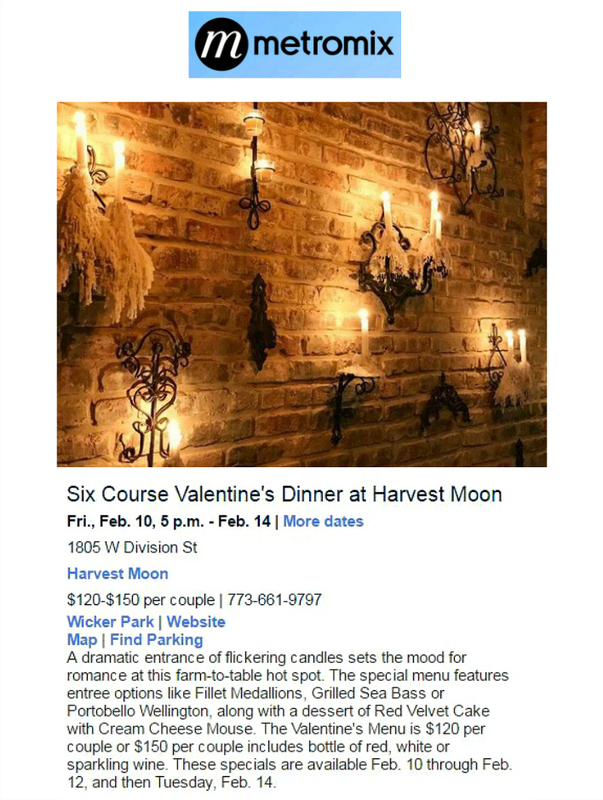 Harvest Moon, 1805 West Division Street, Chicago, 773-661-9797.